Acrylate-acrylamide copolymers are disclosed. They are rigid and glassy in dry state at room temperature (from about 23 DEG C to about 28 DEG C), but are soft and very deformable and have a high refractive index, a high glistening resistance and a low aging-related surface light scattering in fully hydrated state. They are particularly suitable for making wet-packed intraocular lenses (IOLs) which can be delivered through sub 2.0 mm incisions. 本发明是针对疏水性眼科装置材料。  The present invention is directed to ophthalmic device materials hydrophobic. 具体地说，本发明涉及丙烯酸酯-丙烯酰胺共聚物，这些共聚物在干燥状态下是刚性和玻璃状的，但是在水合时是柔软的且基本上不含闪光并且具有高折射率和其他令人希望的性质，这些共聚物特别适合用于制备湿式封装的眼内透镜（IOL)，这些眼内透镜可通过亚2. Omm切口递送。 More specifically, the present invention relates to acrylate - acrylamide copolymers, copolymers which are glassy and rigid in the dry state, but is substantially free of flash and soft and having a high refractive index so that when hydrated, and other human desirable properties of these copolymers are particularly suitable for an intraocular lens (IOL) preparing a wet package, the intraocular lens which can be delivered via an alkylene 2. Omm incision. 随着小切口白内障外科手术的进展，越来越重视开发适用于人工透镜的柔软、可折叠材料。  With the progress of small incision cataract surgery, more and more emphasis on the development of artificial lens is suitable for soft, foldable material. 一般来说，这些材料属于三种类型之一:水凝胶、硅酮和丙烯酸类。 Generally, these materials fall into one of three categories: hydrogels, silicones, and acrylics. —般来说，水凝胶材料具有相对低的折射率，从而使得它们比其他材料更不理想，这是由于实现给定屈光力所需的较厚透镜镜片。  - In general, hydrogel materials have a relatively low refractive index, making them less desirable than other materials, which is due to the relatively thick lens plate to achieve a given refractive power required. 常规硅酮材料通常具有比水凝胶更高的折射率，但是倾向于在以一种折叠位置置于眼睛中之后爆炸式地展开。 Conventional silicone materials generally have a higher refractive index than hydrogels water, but tend to unfold explosively after placed in a folded position in the eye. 爆炸式展开可能潜在损伤角膜内皮和/或破坏天然晶状体囊。 The explosive expansion that could potentially damage the corneal endothelium and / or destruction of the natural lens capsule. 丙烯酸材料是令人希望的，因为它们通常具有高折射率并且比常规硅酮材料更缓慢地或可控地展开。 Acrylic materials are desirable because they typically have a high refractive index and unfold more slowly or controllably than conventional silicone materials. 适用于眼内透镜的丙烯酸材料通常是柔软的和疏水性的，并且具有按重量计小于5%的平衡含水量。  applicable to an intraocular lens of a soft acrylic materials are generally hydrophobic and, and having an equilibrium water content of less than 5% by weight of. 参见例如在美国专利号4834750、5,290,892、5,331，073、5,693,095、5，922,821、6241766、6245106、6313187、6,353,069、6528602、6653422、6703466、6780899、6806337、6872793、7585900、7652076、7714039、7790824、7790825、7799845、7847046、8058323、8,362，177、8,466,209、8,449,610、8,557,892 (通过引用以其全文结合在此）中描述的那些。 See, for example, in U.S. Patent No. 4834750,5,290,892,5,331,073,5,693,095,5,922,821,6241766,6245106,6313187,6,353,069,6528602,6653422,6703466,6780899,6806337,6872793,7585900,7652076,7714039,7790824,7790825, 7799845,7847046,8058323,8,362,177,8,466,209,8,449,610,8,557,892 (incorporated in its entirety by reference herein) those described. 然而，柔软的疏水性丙烯酸材料可以是粘性的。 However, the hydrophobic soft acrylic material may be tacky. 通常期望减少旨在用作一种可折叠眼内透镜的材料中的表面粘性的量。 Desirable to reduce the amount of surface tack is generally intended for use as a foldable intraocular lens within the material. 粘性材料可能难以制造、处理和展开。 Viscous material may be difficult to manufacture, handle, and deployed. 已经尝试降低粘性，以使得透镜更容易加工或处理、更容易折叠或变形，并且具有更短的展开时间。 Attempts have been made to reduce tackiness so that the lenses are easier to process or handle, easier to fold or deform, and have shorter unfolding times. 例如，美国专利号5,603,774披露了一种用于降低柔软丙烯酸材料的粘性的等离子体处理方法。 For example, U.S. Patent No. 5,603,774 discloses a plasma processing method for reducing the viscosity of the soft acrylic material. 美国专利号6，241，766; 6，245，106; 7，585，900; 7，714，039和8，362，177披露了亲水性组分或添加剂用于降低一种柔软丙烯酸材料的粘性的用途。 U.S. Patent Nos. 6,241,766; 6,245,106; 7,585,900; 7,714,039 and 8,362,177 disclose hydrophilic components or additives for reducing a soft acrylic material sticky purposes. 此外，柔软的疏水性丙烯酸材料易于具有在体内形成的闪光(或微液泡），并且可能不利地影响眼内透镜的光学性能。  In addition, the soft hydrophobic acrylic materials tend to have a flash (or micro-bubble) formed in the body, and may adversely affect the optical properties of the intraocular lens. 闪光是存在于一种IOL材料的基质内的水的微小夹杂物，并且由于该IOL材料与该IOL材料内的水之间的折射率的差异而是可见的。 Flash tiny water inclusions within the matrix material present in one of the IOL, and due to the difference in refractive index between the water in the material of the IOL with the IOL material, but visible. 据报道，可以使用含聚乙二醇(PEG)的可聚合组分（单体和/或交联剂）（美国专利号5,693,095、6,353，069和8，449，610)来提高疏水性丙烯酸配制品的抗闪光性。 It is reported, it may be used containing polyethylene glycol (PEG) polymerizable components (monomers and / or crosslinking agent) (U.S. Patent Nos. 5,693,095,6,353,069 and 8,449,610) to improve the hydrophobic acrylic with anti-glare of the article. 但是，为了使其对丙烯酸材料的折射率的不利影响最小化，通常需要少量的PEG二甲基丙烯酸酯或PEG单（甲基)丙烯酸酯浓度。 However, in order to make an adverse impact on the refractive index of the acrylic material is minimized, typically require PEG or PEG dimethacrylate mono (meth) acrylate, a small amount of concentration. PEG二甲基丙烯酸酯或PEG单（甲基)丙烯酸酯的添加还倾向于降低所得到的共聚物的模量和拉伸强度。 PEG or PEG dimethacrylate mono (meth) acrylate is added also tends to lower the modulus of the resulting copolymer and tensile strength. 美国专利号6,140,438披露了一种亲水性单体用于提高柔软疏水性丙烯酸材料的抗闪光性的用途，以及一种（甲基)丙烯酸烷基酯用于提高柔软疏水性丙烯酸材料的柔性和形状恢复性质。  U.S. Patent No. 6,140,438 discloses a hydrophilic monomer for enhancing the anti-glare flexibility of use of hydrophobic acrylic materials, and a (meth) acrylate for improving flexibility hydrophobic acrylic material the flexibility and shape recovery properties. 美国专利号6，329，485和6，657，032披露了柔软的可折叠水凝胶透镜材料，这些材料具有按重量计约5%至30%的水含量，并且由包含以下两种主要单体的一种组合物制成： 一种芳香族高折射率单体和一种亲水性（甲基)丙烯酸酯单体(例如，甲基丙烯酸羟乙酯），该亲水性（甲基)丙烯酸酯单体的量大于该芳香族高折射率单体的量。  U.S. Patent Nos. 6,329,485 and 6,657,032 disclose a foldable soft hydrogel lens material, these materials having from about 5% by weight to 30% water content, and comprising the two a composition made major monomers: an aromatic monomer of high refractive index and one hydrophilic (meth) acrylate monomers (e.g., hydroxyethyl methacrylate), the hydrophilic (meth) acrylate monomer is greater in the amount of the aromatic monomer of high refractive index. 美国专利号6，852，793披露了聚合物组合物，这些聚合物组合物具有按重量计从4.5%至15%的水含量、大约1.45或更高的相对高的折射率、以及大约80%或更高的相对高的伸长率，并且通过一种或多种共聚物与一种或多种亲水性单体(优选N，N-二甲基丙烯酰胺)和任选的一种或多种基于芳香族的单体、疏水性单体或其组合的聚合而产生。  U.S. Patent No. 6,852,793 discloses a polymer composition, which polymer composition has a water content by weight of from 4.5 to 15%, and about 1.45 or more relatively high refractive index, and about 80% or more of the relatively high elongation, and by one or more copolymers with one or more hydrophilic monomers (preferably N, N- dimethylacrylamide), and optionally one or more aromatic-based monomer or a hydrophobic monomer is polymerized to produce a combination. 本发明提供适合用于制备湿式封装的IOL的疏水性丙烯酸酯/丙烯酰胺共聚物材料。  The present invention provides an IOL suitable for the preparation of a wet encapsulated hydrophobic acrylate / acrylamide copolymer material. 除非另外定义，否则在此使用的所有技术和科学术语具有与由本发明所属领域的普通技术人员通常所理解的相同的含义。  Unless defined otherwise, all technical and scientific terms used herein have the same meaning by one of ordinary skill in the art of the present invention is commonly understood. 总体上，在此使用的命名法和实验室程序是本领域众所周知的且常用的。 In general, the nomenclature used herein and the laboratory procedures are well known in the art and commonly used. 常规的方法用于这些程序，如在本领域和各种一般参考文献中提供的那些。 Those conventional methods for these procedures, as provided in the art and various general references. 当术语以单数提供时，诸位发明人也考虑了该术语的复数。 When a term is provided in the singular, the inventors also contemplates the plural of that term. 在此使用的命名法和以下描述的实验室程序是本领域中众所周知的且常用的那些。 Laboratory procedures described below and nomenclature used herein are well known in the art and those commonly used. 如在此使用的“约”意思是一个被称为“约”的数字包括所叙述的数加上或减去那个所叙述的数字的1 % -1 〇%。  As "about" is used herein is meant a called a digital "about" 1% -1% of the square of that number plus or minus numbers recited recited. “任选的”或“任选地”是指后面描述的事项或情形可能发生，或者可能不发生，并且该描述包括该事项或情形发生的情况和不发生的情况。  "Optional" or "optionally" refers to an event or circumstance may occur later described, or may not occur, and that description includes instances where the matter or circumstance occurs and instances where it does not. 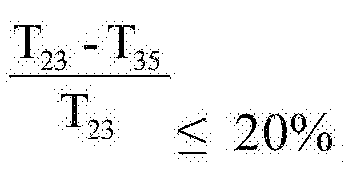 除非另外指明，否则所有组分量都基于％ (w/w) (〃wt.%〃)呈现。  Unless indicated otherwise, all component amounts are based on% (w / w) (〃wt. 〃%) presented. 术语“烷基”是指通过从直链或支链的烷烃化合物移除氢原子而获得的单价基团。  The term "alkyl" refers to a monovalent group obtained by removing a hydrogen atom from an alkane compound is a straight chain or branched chain. 烷基基团（自由基)与有机化合物中的另一个基团形成一个键。 Alkyl group (radical) and the organic compound in another group to form a bond. 术语“亚烷基二价基团”或“亚烷基双基”或“烷基双基”可互换地是指通过从烷基中去除一个氢原子而获得的二价基团。  The term "divalent alkylene radical" or "alkylene diradical" or "alkyl diradical" interchangeably refers to a divalent group obtained by removing one hydrogen atom from an alkyl . 亚烷基二价基团与有机化合物中的其他基团形成两个键。 Alkylene group and a divalent organic group formed of the other two bonds. 术语“烷氧基(alkoxy)”或“烷氧基(alkoxyl)”是指通过从直链或支链烷基醇的羟基基团中去除氢原子而获得的单价基团。  The term "alkoxy (Alkoxy)" or "alkoxy group (alkoxyl)" refers to a monovalent group obtained by removing a hydrogen atom from a hydroxyl group a straight or branched alkyl alcohol. 烷氧基基团（自由基)与有机化合物中的另一个基团形成一个键。 Alkoxy group (radical) and the organic compound in another group to form a bond. 在本申请中，关于烷基二基或烷基基团的术语“取代的”意指该烷基二基或该烷基基团包括至少一个取代基，该至少一个取代基替代该烷基二基或该烷基基团的一个氢原子，并且选自下组，该组由以下各项组成:羟基(-0H)、羧基(-C00H)、-NH2、巯基(-SH)、C1-C4烷基、C1-C4烷氧基、C1-C4烷硫基(烷基硫化物）、C1-C4酰基氨基、C1-C4烷基氨基、二-C1-C4烷基氨基、卤素原子(Br或Cl)、及其组合。  In the present application, the term alkyl group or two alkyl groups "substituted" means that the alkyl group or two alkyl groups comprising at least one substituent, at least one substituent group in place of the a hydrogen atom or an alkyl group two of the alkyl group, and selected from the group consisting of: hydroxy (-0H), carboxy (-C00H), - NH2, mercapto (-SH), C1-C4 alkyl, C1-C4 alkoxy, C1-C4 alkylthio (sulfide group), C1-C4 acylamino, C1-C4 alkylamino, di -C1-C4 alkylamino group, a halogen atom (Br or Cl), and combinations thereof. 其中T23和T35分别是该材料在23°C和35°C下的介于400nm至700nm之间的平均透光率）。 Wherein T23 and T35, respectively, that the material at 23 ° C for between and 35 ° C of the average light transmittance between 400nm to 700nm). 其中A^H或CH3 (优选Η) ; (CH2) ^或[0 (CH2) 2] Z1，其中ml是2-6并且z 1是1-10; Y1 是直接键、0、S、或NR '，其中R ' 是H、CH3、Cn，H2n，+1 (其中η '= 1 -10)、异-OC3H7、C6H5、或CH2C6H5;Wl 是0-6，条件是ml+wl 彡8;并且01是!1、Cl、Br、C1-C4 烷基、C1-C4 烷氧基、C6H5、或CH2C6H5，  wherein A ^ H or CH3 (preferably Η); (CH2) ^ or [0 (CH2) 2] Z1, wherein ml is 2-6 and z 1 is 1-10; Y1 is a direct bond, 0, S , or NR ', wherein R' is H, CH3, Cn, H2n, + 1 (where η '= 1 -10), iso -OC3H7, C6H5, or CH2C6H5; Wl is 0-6, provided that ml + wl San 8; and 01 is 1, Cl, Br, C1-C4 alkyl, C1-C4 alkoxy, C6H5, or CH2C6H5,! 其中处于干燥状态的该眼科装置材料具有大于23°C (优选大于25°C，更优选从约28°C至约40°C)的玻璃化转变温度，其中处于完全水合状态的该眼科装置材料具有:小于20°C (优选小于18°C，更优选小于15°C)的玻璃化转变温度、在589nm和室温（23°C ± 3°C)下测量的大于1.50(优选1.51，更优选1.52)的折射率、在从16°C至45°C的温度下按重量计小于4.5% (优选从约1 %至约4.2%，更优选从约1.5%至约3.9%)的平衡水含量、特征在于不具有明场微液泡和每个观察屏约10个或更少个微液泡的抗闪光性、从约I. OMPa至约60. OMPa(优选从约2. OMPa至约55. OMPa，更优选从约3. OMPa至50. OMPa)的杨氏模量、大于90% (优选至少约100 %，更优选至少约110%)的断裂伸长率、小于6. OMPa (优选约5.5MPa或更低，更优选约5. OMPa或更低）的25%割线模量、以及在10年加速老化(在来自爱尔康的平衡盐溶液(BSS)中90°C，81 The  wherein the ophthalmic device material in a dry state having a glass transition temperature greater than 23 ° C (preferably greater than 25 ° C, more preferably from about 28 ° C to about 40 ° C), wherein in a fully hydrated state ophthalmic device material having: a glass transition temperature less than 20 ° C (preferably less than 18 ° C, more preferably less than 15 ° C) measured at 589nm and at room temperature (23 ° C ± 3 ° C) greater than 1.50 (preferably 1.51 , more preferably 1.52) refractive index, at from 16 ° C to 45 ° C temperature of less than 4.5% by weight (preferably from about 1% to about 4.2%, more preferably from about 1.5% to about 3.9%) of equilibrium water content, characterized in that the micro-bubble having no bright field observation and each panel of about 10 or less anti-glare properties of the micro-bubble, I. OMPa from about to about 60. OMPa (preferably from about to about 2. OMPa 55. OMPa, more preferably from about 3. OMPa to 50. OMPa) Young's modulus of more than 90% (preferably at least about 100%, more preferably at least about 110%) of the elongation at break of less than 6. OMPa ( preferably from about 5.5MPa or less, more preferably about 5. OMPa or less) 25% secant modulus in 10 years, and accelerated aging (in balanced salt solution (BSS from Alcon) was 90 ° C, 81 )之后约30CCT或更低的表面光散射。 After) 30CCT about or less light scattering surface. 根据本发明，本发明的一种装置材料应在干燥状态下具有大于23°C (优选大于25°C，更优选从约28°C至约40°C)的玻璃化转变温度(Tg)，但在完全水合状态下具有小于20°C(优选小于18°C，更优选小于15°C)的玻璃化转变温度。  According to the present invention, an apparatus according to the present invention should have material in a dry state a glass transition temperature greater than 23 ° C (preferably greater than 25 ° C, more preferably from about 28 ° C to about 40 ° C) of ( Tg), but has a glass transition of less than 20 ° C (preferably less than 18 ° C, more preferably less than 15 ° C) transition temperature in the fully hydrated state. 为了在IOL中使用，本发明的处于完全水合状态的装置材料优选展现足够强度、低刚度和低25 %割线模量，以便允许由这些装置材料制成的装置对于微切口应用来说是柔软的和高度可变形的。  For use in the IOL, in a fully hydrated state of the apparatus of the present invention preferably exhibits a sufficient material strength, low stiffness and low 25% secant modulus, in order to allow devices made of these materials means for application to micro-incision He said to be soft and highly deformable. 因此，本发明的一种眼科装置材料将具有：大于90% (优选至少约100 %，更优选至少约110 %)的伸长率(断裂应变％);从约I. OMPa至约60 . OMPa (优选从约2 . OMPa至约55 . OMPa，更优选从约3. OMPa至50. OMPa)的杨氏模量；和小于6 . OMPa (优选约5.5MPa或更低，更优选约5. OMPa或更低）的25 %割线模量。 Thus, an ophthalmic device materials of the present invention will have: greater than 90% (preferably at least about 100%, more preferably at least about 110%) elongation (% strain at break); I. OMPa from about to about 60 OMPa. (preferably from about 2 OMPa OMPa to about 55, more preferably from about 3. OMPa to 50. OMPa..) Young's modulus; and less than 6 OMPa (preferably from about 5.5MPa or less, more preferably about 5. OMPa or less) 25% secant modulus. 具有这类特性，由这种材料制成的透镜在折叠时通常将不会破裂、撕裂或分裂。 Having such properties, a lens made of such materials generally will not crack when folded, tearing or splitting. 聚合物样品的伸长率是基于哑铃形张力测试样品测定的，这些测试样品具有20mm总长度、Ilmm的夹持区长度、2.49mm的总宽度、0.833mm的窄区段宽度、8.83mm的圆角半径和0.9mm的厚度。 Elongation of polymer samples is dumbbell shaped tension test specimens was measured on these test samples having a total length of 20mm, a length Ilmm the clamping zone, the total width of 2.49mm, width of narrow section of 0.833mm, 8.83mm circle of and a thickness of 0.9mm corner radius. 使用具有50牛顿测力传感器的一种英斯特朗（Instron)材料测试仪（型号4442或等效物）在环境条件（23°C ±2°C，50% 土5%相对湿度)下对样品进行测试。 Use of a Instron (an Instron) Material Tester (Model No. 4442 or equivalent) with a 50 Newton load cell at ambient conditions (23 ° C ± 2 ° C, 50% ± 5% relative humidity) for The samples were tested. 夹持距离被设定为11mm，并且十字头速度被设定为50mm/分钟，并且牵拉样品直至破坏。 Clamping distance is set to 11mm, and the crosshead speed is set at 50mm / min, and pulling the sample until destruction. 伸长率(应变)被报告为在破坏时的位移与原始夹持距离之比。 Elongation (strain) is reported as the ratio of the displacement distance of the original holder during failure. 断裂应变被报告为在破坏时的位移与原始夹持距离之比。 Fracture strain is the displacement ratio of the original holding distance when the failure is reported. 假定初始面积保持恒定，以用于样品的最大负荷，典型地是样品断裂时的负荷计算断裂应变。 It assumed that the initial area remains constant, the maximum load for the sample, typically the load when the sample breaks the fracture strain is calculated. 由应力-应变曲线在线性弹性区域中的瞬时斜率计算杨氏模量。 The stress - strain Young's modulus of the instantaneous slope of the curve in the linear elastic region is calculated. 50%割线模量被计算为在应力-应变曲线上在0%应变与50%应变之间绘出的直线的斜率。 50% secant modulus is calculated as the stress - strain curve and a strain of 50% of the slope of the line drawn between 0% strain. 100%割线模量被计算为在应力-应变曲线上在0%应变与100%应变之间绘出的直线的斜率。 100% secant modulus is calculated as the stress - strain curve and a strain of 100% of the slope of the line drawn between 0% strain. 由于待测试的材料基本上是柔软弹性体，所以将它们负载到英斯特朗机器中往往会使它们弯曲。 Since the material to be tested are essentially soft elastomers, loading them so Instron machine tends to make them curved. 为了除去材料样品中的松弛，将预负荷放置在样品上。 To remove the slack in the material sample, the preload placed on the sample. 这有助于减少松弛并且提供更一致的读数。 This helps to reduce the slack and provide a more consistent reading. 一旦将样品预负载至期望值(典型地0.03至0.05N)，就将应变设定为零并且开始测试。 Once the sample is pre-loaded to a desired value (typically 0.03 to 0.05N), the strain will be set to zero and start the test. 本发明的一种装置材料优选地进一步具有在16°C_45°C的温度范围内按重量计小于4.5 % (优选从约1 %至约4.2 %，更优选从约1.5 %至约3.9 %)的平衡水含量。  The material is preferably an apparatus according to the present invention further has a temperature range of 16 ° C_45 ° C of less than 4.5% by weight (preferably from about 1% to about 4.2%, more preferably from about 1.5% to about 3.9 %) of the equilibrium water content. 这些装置材料优选地是抗闪光的，这样使得当在45°C的水中平衡且随后冷却至环境温度（大约22°C)时，应不产生BF微液泡和至多10个DF微液泡，如通过显微镜检查所检测。 These materials are preferably means is an anti-flash, so that when the balance in water at 45 ° C and then cooling to ambient temperature (approximately 22 ° C), should not produce BF micro-bubble and at most 10 DF micro-bubble, such as by microscopic examination detected. 具有化学式⑴的芳基丙烯酸单体可以通过本领域中已知的方法来制备。  The aryl acrylic monomer having the chemical formula ⑴ can be prepared by methods known in the art. 例如，所希望的单体的共辄醇可以与丙烯酸甲酯、钛酸四丁酯(催化剂)和诸如4-苄氧基苯酚的聚合抑制剂在反应容器中组合。 For example, the desired alcohol monomers may be co-noir, tetrabutyl titanate (catalyst), and a polymerization inhibitor such as 4-benzyloxy-phenol with methyl acrylate in combination in the reaction vessel. 然后可以加热容器来促进反应并且蒸馏出反应副产物以便驱使反应完成。 Vessel can then be heated to facilitate the reaction and distill off the reaction by-products to drive the reaction to completion. 替代合成方案涉及向共辄醇中加入丙烯酸并用一种碳二亚胺催化或将共辄醇与丙烯酰氯和一种碱(如吡啶或三乙胺)混合。 Alternative synthesis schemes involve adding acrylic acid to the alcohol and mixed co Noir carbodiimide in a catalytic or co Noir alcohol with acryloyl chloride and a base (e.g. pyridine or triethylamine). 具有化学式⑴的适合芳基丙烯酸单体包括但不限于:丙烯酸2-乙基苯氧基酯；甲基丙烯酸2-乙基苯氧基酯;丙烯酸苯酯；甲基丙烯酸苯酯;丙烯酸苄酯；甲基丙烯酸苄酯;丙烯酸2-苯基乙酯；甲基丙烯酸2-苯基乙酯；丙烯酸3-苯基丙酯；甲基丙烯酸3-苯基丙酯；丙烯酸4-苯基丁酯；甲基丙烯酸4-苯基丁酯；丙烯酸4-甲基苯酯；甲基丙烯酸4-甲基苯酯；丙烯酸4-甲基苄酯；甲基丙烯酸4-甲基苄酯；丙烯酸2-2-甲基苯乙酯；甲基丙烯酸2,2_甲基苯乙酯；丙烯酸2,3_甲基苯乙酯；甲基丙烯酸2,3_甲基苯乙酯；丙烯酸2,4_甲基苯乙酯；甲基丙烯酸2，4-甲基苯乙酯;丙烯酸2- (4-丙基苯基）乙酯；甲基丙烯酸2- (4-丙基苯基）乙酯;丙烯酸2-(4-(1-甲基乙基)苯基）乙酯；甲基丙烯酸2-(4-(1-甲基乙基)苯基）乙酯；丙烯酸2-(4-甲氧基苯基）乙酯；甲基丙烯酸2-(4-甲氧基苯基）乙酯;丙烯酸2-(4-  having the chemical formula include but are not limited ⑴ suitable aryl acrylic monomers: ethyl acrylate, 2-phenoxyethyl acrylate; methacrylate, 2-phenoxy ethyl acrylate; phenyl acrylate; phenyl methacrylate; benzyl acrylate; benzyl methacrylate; 2-phenylethyl acrylate; methacrylate, 2-phenylethyl methacrylate; acrylate, 3-phenyl-propyl; 3-phenyl-propyl methacrylate; acrylate, 4-phenylbutyl butyl acrylate; 4-phenyl-butyl methacrylate; acrylate, 4-methylphenyl acrylate; methyl methacrylate, phenyl methacrylate; 4-methylbenzyl acrylate; methacrylic acid 4-methylbenzyl ester; 2-2- benzyl acrylate, methyl methacrylate; methyl methacrylate, phenyl methacrylate 2,2_; benzyl acrylate, methyl methacrylate 2,3_; methyl methacrylate, phenyl methacrylate 2,3_; acrylate, 2 , 4_ methyl benzyl methacrylate; methyl methacrylate, 2,4-benzene; ethyl methacrylate, 2- (4-propylphenyl) ethyl; methacrylate, 2- (4-propylphenyl) ethyl methacrylate; 2- (4- (1-methylethyl) phenyl) ethyl; methacrylate, 2- (4- (1-methylethyl) phenyl) ethyl; acrylate, 2- (4- methoxyphenyl) acrylate; methacrylate, 2- (4-methoxyphenyl) ethyl methacrylate; acrylate, 2- (4- 环己基苯基）乙酯；甲基丙烯酸2-(4-环己基苯基）乙酯；丙烯酸2-(2-氯苯基）乙酯；甲基丙烯酸2-(2-氯苯基）乙酯；丙烯酸2-(3-氯苯基）乙酯；甲基丙烯酸2-(3-氯苯基）乙酯；丙烯酸2-(4-氯苯基）乙酯；甲基丙烯酸2-(4-氯苯基）乙酯；丙烯酸2-(4-溴苯基）乙酯；甲基丙烯酸2-(4-溴苯基）乙酯;丙烯酸2-(3-苯基苯基）乙酯；甲基丙烯酸2-(3-苯基苯基）乙酯;丙烯酸2-(4-苯基苯基）乙酯；甲基丙烯酸2- (4-苯基苯基）乙酯；丙烯酸2- (4-苄基苯基）乙酯；甲基丙烯酸2- (4-苄基苯基）乙酯；丙烯酸2-(苯硫基）乙酯；甲基丙烯酸2-(苯硫基）乙酯;丙烯酸2-苄氧基乙酯；丙烯酸3-苄氧基丙酯；甲基丙烯酸2-苄氧基乙酯；甲基丙烯酸3-苄氧基丙酯;丙烯酸2-[2-(苄氧基）乙氧基]乙酯；甲基丙烯酸2-[2-(苄氧基）乙氧基]乙酯;或其组合。 Cyclohexyl phenyl) ethyl; methacrylate, 2- (4-cyclohexyl-phenyl) ethyl; 2- (2-chlorophenyl) ethyl; methacrylate, 2- (2-chlorophenyl) acetate methacrylate; 2- (3-chlorophenyl) ethyl; methacrylate, 2- (3-chlorophenyl) ethyl; 2- (4-chlorophenyl) ethyl; methacrylate, 2- (4 - chlorophenyl) ethyl; 2- (4-bromophenyl) ethyl; methacrylate, 2- (4-bromophenyl) ethyl; acrylate, 2- (3-phenylphenyl) ethyl methacrylate; methacrylate, 2- (3-phenylphenyl) ethyl methacrylate; acrylate, 2- (4-phenylphenyl) ethyl; methacrylate, 2- (4-phenylphenyl) ethyl methacrylate; acrylate, 2- ( 4-benzyl-phenyl) ethyl; methacrylate, 2- (4-benzyl-phenyl) ethyl methacrylate; acrylate, 2- (phenylthio) ethyl; methacrylate, 2- (phenylthio) ethyl; acrylate, 2-benzyloxy-ethyl; 3-benzyloxy-propyl acrylate; methacrylate, 2-benzyloxy-ethyl; 3-benzyloxy-propyl methacrylate; 2- [2- (benzyloxy ) ethoxy] ethyl ester; methacrylate, 2- [2- (benzyloxy) ethoxy] ethyl ester; or a combination thereof. 具有化学式(I)的优选芳基丙烯酸单体是其中也是(CH2)ml,ml是2-5,Y1不存在或是〇，wl是0或1，且01是!1的那些。  The aryl group is preferably an acrylic monomer having the formula (I) are those wherein is (CH2) ml, ml is 2-5, Y1 is absent or square, WL is 0 or 1, and is 01! 1 of those. 最优选的是丙烯酸2-苯基乙酯;丙烯酸3-苯基丙酯;丙烯酸4-苯基丁酯；丙烯酸5-苯基戊酯；丙烯酸2-苄氧基乙酯；丙烯酸3-苄氧基丙酯；丙烯酸2- [2-(苄氧基）乙氧基]乙酯；以及其相应的甲基丙烯酸酯。 Most preferred are 2-phenylethyl acrylate; 3-phenyl-propyl acrylate; 4-phenyl-butyl acrylate; 5-phenyl-pentyl acrylate, methacrylate; 2-benzyloxy-ethyl; 3-benzyl acrylate oxygen propyl group; 2- [2- (benzyloxy) ethoxy] ethyl ester; and the corresponding methacrylates. 用于制备本发明的一种眼科装置材料的可聚合组合物优选包含按重量计从约51%至约78% (优选从约54%至约75%，更优选从约60%至约70%)的一种或多种具有化学式⑴的芳基丙烯酸单体。  for the preparation of an ophthalmic device material of the present invention is a polymerizable composition comprising by weight, preferably from about 51% to about 78% (preferably from about 54% to about 75%, more preferably from about 60% to about 70%) one or more aryl acrylic monomer having the chemical formula of ⑴. 用于制备本发明的一种眼科装置材料的可聚合组合物优选包含按重量计从约20%至约35 % (优选从约20%至约30 %，更优选从约22.5%至约27.5%)的N，-二甲基丙烯酰胺。  for the preparation of an ophthalmic device material of the present invention is a polymerizable composition comprising by weight, preferably from about 20% to about 35% (preferably from about 20% to about 30%, more preferably from about 22.5% to about 27.5%) of N, - dimethyl acrylamide. 用于制备本发明的一种眼科装置材料的可聚合组合物进一步优选地包含一种可聚合的交联剂。  The polymerizable composition for preparing an ophthalmic device materials of the present invention preferably further comprises one polymerizable crosslinking agent. 该交联剂可以是具有多于一个不饱和基团的任何末端烯属不饱和化合物。 The crosslinking agent may be any having more than one unsaturated compounds with terminal ethylenic unsaturated groups. 适合的交联剂包括，例如：乙二醇二甲基丙烯酸酯；二乙二醇二甲基丙烯酸酯；三乙二醇二甲基丙烯酸酯；四乙二醇二甲基丙烯酸酯；甲基丙烯酸烯丙酯；1，3_丙二醇二甲基丙烯酸酯；2,3_丙二醇二甲基丙烯酸酯；1，6_己二醇二甲基丙烯酸酯；1，4_丁二醇二甲基丙烯酸酯；乙二醇二丙烯酸酯;二乙二醇二丙烯酸酯;三乙二醇二丙烯酸酯；四乙二醇二丙烯酸酯；丙烯酸烯丙酯；1，3-丙二醇二丙烯酸酯;2，3-丙二醇二丙烯酸酯；1，6-己二醇二丙烯酸酯；1，4-丁二醇二丙烯酸酯;N，N' -六亚甲基双丙烯酰胺;N，N' -六亚甲基双甲基丙烯酰胺;N，Ν' -二羟基亚乙基双丙烯酰胺;N，N' -二羟基亚乙基双甲基丙烯酰胺;N，N' -亚甲基双丙烯酰胺;N，Ν' -亚甲基双甲基丙烯酰胺;CH2 = C (CH3) C (=0) O- (CH2CH2O) PC (=0) C (CH3) = CH2，其中p = 1 -50; CH2 = CHC (=0) 0- (CH2CH2O) pC (=0) CH=CH2，其中p = 1 -50; C Suitable crosslinking agents include, for example: ethylene glycol dimethacrylate; diethylene glycol dimethacrylate; triethylene glycol dimethacrylate; tetraethylene glycol dimethacrylate; methyl allyl methacrylate; 1,3_ glycol dimethacrylate; 2,3_ glycol dimethacrylate; 1,6_ hexanediol dimethacrylate; 1,4_-butanediol dimethacrylate acrylate; ethylene glycol diacrylate; diethylene glycol diacrylate; diacrylate triethylene glycol; tetraethylene glycol diacrylate; allyl methacrylate; 1,3-propanediol diacrylate; 2, 1,3-propanediol diacrylate; 1,6-hexanediol diacrylate; 1,4-butanediol diacrylate; N, N '- hexamethylene bis acrylamide; N, N' - hexamethylene bis methacrylamide; N, Ν '- dihydroxy ethylene bis acrylamide; N, N' - dihydroxy ethylene bis methacrylamide; N, N '- methylene bis acrylamide; N , Ν '- methylene bis methacrylamide; CH2 = C (CH3) C (= 0) O- (CH2CH2O) PC (= 0) C (CH3) = CH2, wherein p = 1 -50; CH2 = CHC (= 0) 0- (CH2CH2O) pC (= 0) CH = CH2, wherein p = 1 -50; C H2 = C (CH3) C (=0)0 (CH2) t〇-C (=0) C (CH3) = CH2，其中t = 3-20;以及CH2 = CHC (=0) 0 (CH2) t〇-C (=0) CH=CH2，其中t = 3-20。 H2 = C (CH3) C (= 0) 0 (CH2) t〇-C (= 0) C (CH3) = CH2, where t = 3-20; and CH2 = CHC (= 0) 0 (CH2) t square-C (= 0) CH = CH2, wherein t = 3-20. 一种优选的交联单体是1，6-己二醇二丙烯酸酯、1，4-丁二醇二丙烯酸酯、或N，Ν'-六亚甲基双丙烯酰胺。 A preferred crosslinking monomer is 1,6-hexanediol diacrylate, 1,4-butanediol diacrylate, or N, Ν'- hexamethylene bisacrylamide. 通常，交联组分的总量是按重量计从约1.0%至约6.0%，优选按重量计从约1.5%至约5.0 %，更优选按重量计从约2.0 %至约4.0 %。  Generally, the total amount of the crosslinking component is by weight from about 1.0% to about 6.0%, by weight, preferably from about 1.5% to about 5.0% from by weight, more preferably from about 2.0% to about 4.0 %. 用于制备本发明的一种眼科装置材料的可聚合组合物可以进一步包含一种或多种疏水性丙烯酰胺组分，该一种或多种疏水性丙烯酰胺组分选自下组，该组由以下各项组成:N-丁基丙烯酰胺、N-丁氧基甲基丙烯酰胺、N-甲氧基丙基丙烯酰胺、以及Ν，Ν' -六亚甲基双丙烯酰胺(优选选自下组，该组由以下各项组成:N-丁基丙烯酰胺、N-丁氧基甲基丙烯酰胺和Ν，Ν' -六亚甲基双丙烯酰胺）。  The polymerizable composition for preparing an ophthalmic device materials of the present invention may further comprise one or more hydrophobic acrylamide component, the one or more hydrophobic component is selected from the group consisting of acrylamide, from the group consisting of: N- butyl acrylamide, N- butoxymethyl acrylamide, N- methoxypropyl acrylamide, and Ν, Ν '- hexamethylene bisacrylamide ( preferably selected from the group consisting of: N- butyl acrylamide, N- butoxymethyl acrylamide and Ν, Ν '- hexamethylene bisacrylamide). 据信可以添加一种疏水性丙烯酰胺组分以便在平衡盐溶液(在90°C下持续81天）中10年加速老化后进一步减少表面光散射。 It is believed possible to add a hydrophobic acrylamide component in balanced salt solution to accelerated aging (at 90 ° C for continuous 81 days) in 10 years to further reduce the surface of the light scattering. 用于制备本发明的一种眼科装置材料的可聚合组合物可以进一步包含甲基丙烯酸2-羟乙酯。  The polymerizable composition for preparing an ophthalmic device materials of the present invention may further comprise methacrylate, 2-hydroxyethyl methacrylate. 据信还可以添加甲基丙烯酸2-羟乙酯以便在平衡盐溶液(在90°C下持续81天）中10年加速老化后进一步减少表面光散射。 It is also believed methacrylate, 2-hydroxyethyl methacrylate was added to the balanced salt solution after accelerated aging (at 90 ° C for continuous 81 days) in 10 years to further reduce the surface of the light scattering. 用于制备本发明的一种眼科装置材料的可聚合组合物可以进一步包含一种含聚(乙二醇）的（含PEG的）可聚合组分。  The polymerizable composition for preparing an ophthalmic device materials of the present invention may further comprise one containing a poly (ethylene glycol) (PEG-containing) polymerizable component. 据信，还可以添加一种含PEG的可聚合组分以便进一步减少或消除当将本发明的处于完全水合状态的一种丙烯酸酯/丙烯酰胺共聚材料从室温(RT)加热至35°C时发生的潜在雾度问题。 It is believed that PEG may also be added containing polymerizable components in order to further reduce or eliminate an acrylate when in the fully hydrated state of the present invention / acrylamide copolymer material is heated from room temperature (RT) to 35 ° C when potential haze problems that occur. 根据本发明，一种含PEG的可聚合组分可以是具有如上所述的一个或两个末端可聚合基团的直链聚（乙二醇)或具有如上所述的三个或更多个末端可聚合基团的支链聚（乙二醇）。  According to the present invention, a PEG-containing polymerizable component as described above may be a linear one or two terminal poly (ethylene glycol) or a polymerizable group having three or above more terminal polymerizable group is a branched poly (ethylene glycol). 这种含PEG的可聚合组分可以根据本领域中已知的方法由具有一个或多个末端官能团（例如，羟基、氨基或羧基基团）的可商购的聚乙二醇制备。 Preparation of polyethylene glycol may be commercially available by having one or more terminal functional groups (e.g., hydroxyl, amino or carboxyl groups) may be commercially according to methods known in the art such PEG-containing polymerizable component. 一般来说，将一种具有一个或多个羟基末端基团的聚（乙二醇)溶解于四氢呋喃中，并且在三乙胺或吡啶存在下用（甲基）丙烯酸衍生物如甲基丙烯酰氯或甲基丙烯酸酐处理。 In general, the polyethylene having one or more hydroxyl end groups (ethylene glycol) was dissolved in tetrahydrofuran, and the presence of a (meth) acrylic acid derivatives such as methacrylic acid chloride in triethylamine or pyridine or methacrylic anhydride process. 反应进行直到大于90 %的羟基基团已被转化为相应的丙烯酸酯或甲基丙烯酸酯。 The reaction until greater than 90% of the hydroxyl groups have been converted to the corresponding acrylate or methacrylate. 过滤聚合物溶液，并且通过沉淀到二乙醚中来分离聚合物。 The polymer solution was filtered, and the polymer was isolated by precipitation into diethyl ether. 使用适合的（甲基)丙烯酸衍生物将胺和羧酸封端的聚乙二醇以一种类似的方式官能化。 Using suitable (meth) acrylic acid derivatives of the amine and carboxylic acid-terminated polyethylene glycol in a similar manner functionalization. 其中：A2是H或CH35Q2和Q2'彼此独立地是直接键、0、ΝΗ、或C (=0) NHCH2CH2O5X2和X2'彼此独立地是直接键、0、NH、0C (=0) ΝΗ、或NHC (=0) NH (优选地是直接键或0) ;R2和R2'彼此独立地是直接键或（CH2)p (优选地是直接键）；p=l-3;G2是HX1-C4烷基、（CH2) m2NH2、（CH2)m2C02H、或R2 ' -X2 ' -Q2 ' -C ( = 0) CA2 - CH2 (优选地是心乂彳烷基或1?2'-父2'-〇2'-(：( = 0)〇八2-CH2) ;m2 = 2-6;并且当G = H、C1-C4烷基、（CH2) m2NH2、或(CH2) m2C02H时，n2 = 45-225;否贝丨J，n2 =51-225 (优选当G2 = Ci-C4烷基时，n2 = 45-180,否则n2 = 51-225)。  wherein: A2 is H or CH35Q2 and Q2 'is independently a direct bond, 0, ΝΗ, or C (= 0) NHCH2CH2O5X2 and X2' are independently a direct bond, 0, NH, 0C (= 0) ΝΗ, or NHC (= 0) NH (preferably a direct bond or 0); R2 and R2 'are each independently a direct bond or (CH2) p (preferably a direct bond); p = l-3; G2 is HX1-C4 alkyl, (CH2) m2NH2, (CH2) m2C02H, or R2 '-X2' -Q2 '-C (= 0) CA2 -? CH2 (preferably an alkyl group or a heart qe left foot 2'parent 2'-〇2 '- (:( = 0) 〇 eight 2-CH2); m2 = 2-6; when and when G = H, C1-C4 alkyl, (CH2) m2NH2, or (CH2) m2C02H, n2 = 45-225; No shell Shu J, n2 = 51-225 (preferably when G2 = Ci-C4 alkyl group, n2 = 45-180, or n2 = 51-225). 具有化学式（II)的含PEG的可聚合组分可以通过本领域中已知的方法来制备。  PEG-containing chemical having a formula (II) is a polymerizable component can be prepared by methods known in the art. 例如，它们可以根据上述程序或如美国专利号8,449,610 (通过引用以其全文结合在此）中所述的方法来制备。 For example, they may be in accordance with the procedure described above as described in U.S. Patent No. 8,449,610, or prepared (incorporated by reference in its entirety herein) according to the method. 尽管本发明的装置材料中包含的具有化学式（II)的含PEG可聚合组分的总量是按重量计这些装置材料的可聚合组分的总量的从约1%至约5% (优选从约2%至约5%，更优选从约2%至约4%)，但是这种量可以包含一种具有化学式（II)的含PEG可聚合组分或多种具有化学式（II)的含PEG可聚合组分的组合。  Although the amount containing chemical having the formula (II) is PEG polymerizable component materials of the present invention, the apparatus is contained, by weight of these materials means the total amount of polymerizable component from about 1% to about 5 % (preferably from about 2% to about 5%, more preferably from about 2% to about 4%), but this may comprise an amount containing chemical having formula (II) is PEG or more polymerizable component having the formula ( II) a polymerizable component containing PEG composition. 具有化学式（II)的含PEG可聚合组分具有2， 000-10，000道尔顿、优选2，000-8，000道尔顿、更优选2，000-6，000道尔顿、以及最优选2，500-6,000道尔顿的数均分子量。 Having formula (II) is PEG having a polymerizable component 2, 000-10,000 Daltons, preferably 2,000 to 8,000 Daltons, more preferably 2,000 to 6,000 Daltons, and the most preferred number average molecular weight 2,500-6,000 daltons. 除了以上所述的可聚合组分之外，本发明的这些眼科装置材料还可以包含其他成分，这些成分包括但不限于可聚合的UV吸收剂(UV-absorber)(或UV吸收剂(UV-absorbingagent))、可聚合的着色染料、娃氧烧单体、以及其组合。  In addition to the above-described polymerizable component, such ophthalmic device materials of the present invention may further comprise other ingredients which may include but are not limited to polymerizable UV absorber (UV-absorber) (or UV absorbers (UV-absorbingagent)), the polymerizable colored dye, baby oxygen burning monomers, and combinations thereof. —种可聚合的紫外线(UV)吸收剂也可以包括在本发明的这些材料中。  - species polymerizable ultraviolet (UV) absorbers may also be included in these materials of the present invention. 该可聚合的UV吸收剂可以是吸收UV光（S卩，波长短于约380nm的光)和任选的高能量紫外光(HEVL) (BP，波长介于380nm与440nm之间的光）、但不吸收任何实质量的波长大于440nm的可见光的任何化合物。 The polymerizable UV absorber may absorb UV light (S Jie short wavelength light of about 380nm), and optionally a high energy ultraviolet light (HEVL) (BP, the wavelength range between 380nm and 440nm light), but it does not absorb any substantial amount of visible light of wavelengths greater than 440nm of any compound. 当单体混合物聚合时，UV吸收化合物被并入到单体混合物中并且被截留在聚合物基质中。 When the monomer mixture is polymerized, UV absorbing compound is incorporated into the monomer mixture and is entrapped in the polymer matrix. 可以在本发明中使用任何适合的可聚合UV吸收剂。 Any suitable polymerizable UV absorbers in the present invention. 在本发明中使用的一种可聚合UV吸收剂包含一个二苯甲酮部分或优选地一个苯并三唑部分。 For use in the present invention may contain a polymerizable UV absorber or benzophenone moiety is preferably a benzotriazole moiety. 可聚合的含二苯甲酮的UV吸收剂可以根据美国专利号3，162，676和4，304，895 (通过引用以其全文结合在此）中描述的程序来制备，或者可以从商业供应商获得。 Containing a polymerizable benzophenone UV absorber according to U.S. Patent Nos. 3,162,676 and 4,304,895 (incorporated by reference in its entirety herein) was prepared as described in the procedure, or may be supplied from the commercial quotient obtained. 可聚合的含苯并三唑的UV吸收剂可以根据美国专利号3,299，173、4,612,358、4,716,234、4,528,311、8,153,703、以及US 8,232,326 (通过引用以其全文结合在此)中描述的程序来制备，或者可以从商业供应商获得。 Polymerizable benzotriazole UV absorbers according to U.S. Patent Nos. 3,299,173,4,612,358,4,716,234,4,528,311,8,153,703, and US 8,232,326 (incorporated by reference in its entirety herein) was prepared as described in the program, or It can be obtained from commercial suppliers. 优选的可聚合的含二苯甲酮的UV吸收剂的实例包括但不限于2-羟基-4-丙烯酰氧基烷氧基二苯甲酮、2-羟基-4-甲基丙烯酰氧基烷氧基二苯甲酮、烯丙基-2-羟基二苯甲酮、 4- 丙烯酰基乙氧基-2-羟基二苯甲酮(UV2)、2-羟基-4-甲基丙烯酰基氧基二苯甲酮(UV7)、或其组合。  Examples of the benzophenone-containing UV absorber may preferably include, but are not limited to polymerizable hydroxy-4-acryloxy alkoxy benzophenones, 2-hydroxy-4-methyl propene acyloxy-alkoxy benzophenones, allyl-2-hydroxy benzophenone, 4-acryloyl-ethoxy-2-hydroxybenzophenone (UV2), 2- hydroxy-4-methyl acryloyl oxy benzophenone (UV7), or combinations thereof. 更优选地，一种可聚合的UV吸收剂是2- (2H-苯并[d] [1，2,3]三唑-2-基)-4-甲基-6- (2-甲基烯丙基)苯酚(oMTP)、甲基丙烯酸3- [3-叔丁基-4-羟基-5- (5-甲氧基-2-苯并[d][1，2，3]三唑-2-基)苯氧基]丙酯(UV13)、以及甲基丙烯酸2- [3- (2H-苯并三唑-2-基)-4-羟基苯基]乙酯(Norbloc 7966)、或其组合。  More preferably, one polymerizable UV absorber is 2- (2H- benzo [d] [1,2,3] triazol-2-yl) -4-methyl-6- (2 - methylallyl) phenol (oMTP), methacrylic acid 3- [3-tert-butyl-4-hydroxy-5- (5-methoxy-2-benzo [d] [1,2,3 ] triazol-2-yl) phenoxy] propyl (UV13), methacrylic acid and 2- [3- (2H- benzotriazol-2-yl) -4-hydroxyphenyl] ethyl methacrylate (, Norbloc 7966), or a combination thereof. 除了紫外线吸收材料之外，由本发明的共聚物制成的眼科装置还可以包括着色染料，如在美国专利号5,470,932和8,207,244中披露的黄色染料。  In addition to ultraviolet absorbing materials, ophthalmic devices made of the copolymers of the invention may also include a coloring dye, as disclosed in U.S. Patent Nos. 5,470,932 and 8,207,244 yellow dye. 通过常规聚合方法来制备本发明的共聚物。  The copolymer of the present invention are prepared by conventional polymerization processes. 例如，制备处于所希望比例的一种或多种具有化学式⑴的单体、N，N_二甲基丙烯酰胺和一种交联剂，连同任何其他可聚合组分如一种UV吸收剂、黄色染料和一种常规热引发剂(或一种光引发剂）的一种混合物。 For example, in the preparation of the desired one or more monomers having the formula ⑴ proportion, N, N_-dimethyl acrylamide and a crosslinking agent, together with any other polymerizable component such as one UV absorber, yellow agent (or a photoinitiator) and a mixture of dyes in a conventional thermal initiator. 然后可以将该混合物引入到一种具有所希望形状的模具中，并且热地（即，通过加热）或光化学地(即，通过光化辐射，例如UV辐射和/或可见光辐射)进行聚合以便活化引发剂。 The mixture may then be introduced into a mold having a desired shape, and thermally (i.e., by heating) or photochemically polymerized (i.e., by actinic radiation, such as UV radiation and / or visible radiation) in order to activate initiator. 优选地，将混合物热固化。 Preferably, the mixture is thermally cured. 在一个优选的实施例中，热固化包括在约20分钟的时间段内从室温(23°C ±2°C)至约80 °C的热斜率，在约80 °C下固化约一小时，以及在约20分钟内斜升至100 °C和在约100°(：下固化约2小时。优选地根据该优选的固化实施例制造厚片。  In a preferred embodiment, the heat curing comprises thermal slope to about to 80 ° C, cured at from about 80 ° C to about room temperature (23 ° C ± 2 ° C) over a period of about 20 minutes at for one hour and ramped over about 20 minutes at about 100 ° C and 100 ° (:. cured for about 2 hours preferred embodiment manufactured according to this preferred embodiment of a cured slab. 在另一个优选的实施例中，热固化包括在约100°C下固化约3小时。  In another preferred embodiment, the curing comprises thermal curing at about 100 ° C for about 3 hours. IOL优选地根据该优选的固化实施例制造，因为它可能提供减少的表面散射和减少的体雾度。 IOL manufactured according to this preferred embodiment preferred curing embodiment, since it is possible to provide reduced surface scattering and haze decrease thereof. 适合的热引发剂的实例包括但不限于：偶氮腈，如2,2'-偶氮双（2，4_二甲基戊腈）、2,2'_偶氮双（2-甲基丙腈）、2,2'_偶氮双（2-甲基丁腈）、2,2' -偶氮双（异丁腈）(AIBN);过氧化物，如过氧化苯甲酰;过氧化碳酸酯，如Perkadox 16 (过氧化二碳酸双-(4-叔丁基环己基)酯）等。 Examples  Suitable thermal initiators include, but are not limited to: azo nitriles, such as 2,2'-azobis (2,4_-dimethylvaleronitrile), 2,2'_ azobis (2 - methylpropionitrile), 2,2'_ azobis (2-methylbutyronitrile), 2,2 '- azobis (isobutyronitrile) (of AIBN); peroxides such as benzoyl peroxide acyl; peroxycarbonate, such as Perkadox 16 (diisopropyl peroxydicarbonate, bis - (4-t-butylcyclohexyl) acrylate) and the like. 一种优选的引发剂是AIBN，更优选Luperox A98 (过氧化二苯甲酰）。 A preferred initiator is AIBN, more preferably Luperox A98 (dibenzoyl peroxide). 据发现Luperox A98优于AIBN，特别是对于在无晶片等离子体处理的情况下防止预释放而言。 It was found that superior Luperox A98 AIBN, especially for purposes of preventing the pre-release in the absence of plasma treatment of the wafer. 当光化学地进行聚合时，一种模具应是对具有能够引发聚合的波长的光化辐射透明的。  When polymerization is carried out photochemically, A mold should be actinic radiation having a wavelength capable of initiating polymerization transparent. 还可以引入常规光引发剂化合物，例如二苯甲酮型或双酰基氧化膦(BAPO)光引发剂，以便促进聚合。 It may also be introduced into a conventional photoinitiator compounds, such as benzophenone type or a bisacylphosphine oxide (BAPO) photoinitiators, in order to facilitate the polymerization. 适合的光引发剂是苯偶姻甲醚、二乙氧基苯乙酮、苯甲酰基氧化膦、1-羟基环己基苯基酮、Darocur和Irgacur型光引发剂（优选Darocurl 17.3③、Darocur 2959®和Irgacure8】9®)，以及基于锗的Norrish I型光引发剂，这些光引发剂能够在用光源(包括约400至约550nm范围内的光）照射下引发自由基聚合。 Suitable photoinitiators are benzoin methyl ether, diethoxyacetophenone, a benzoylphosphine oxide, 1-hydroxycyclohexyl phenyl ketone, Darocur and Irgacur type photoinitiator (preferably Darocurl 17.3③, Darocur 2959 ®] and Irgacure8 9®), and a photoinitiator Norrish type I germanium-based agent, a photoinitiator capable of initiating the free radical polymerization at a light source (including a light within the range of from about 400 to about 550nm) is irradiated. 苯甲酰基膦引发剂的实例包括2,4， 6-三甲基苯甲酰基二苯基氧化膦;双-(2，6-二氯苯甲酰基）-4-N-丙基苯基氧化膦；和双-(2，6_二氯苯甲酰基)-4-N-丁基苯基氧化膦。 Examples of benzoylphosphine initiators include 2,4,6-trimethyl benzoyl diphenyl phosphine oxide; bis - (2,6-dichlorobenzoyl) -4-N- oxide-propylphenyl phosphine; and bis - (2,6_-dichlorobenzoyl) phenylphosphine oxide butyl -4-N-. 基于锗的Norrish I型光引发剂的实例是在US7，605，190 (通过引用以其全文结合在此）中描述的酰基锗化合物。 Examples of the germanium-based Norrish Type I photoinitiator in US7,605,190 (incorporated by reference in its entirety herein) acyl germanium compound is described. 一旦本发明的眼科装置材料已经固化，就将它们萃取在一种适合的溶剂中以便除去尽可能多的这些材料的未反应组分。  Once the ophthalmic device materials of the present invention have been cured, they will be extracted in a suitable solvent to remove as much of the unreacted components of these materials. 适合的溶剂的实例包括丙酮、甲醇和环己烷。 Examples of suitable solvents include acetone, methanol and cyclohexane. 一种优选的萃取溶剂是丙酮。 A preferred extraction solvent is acetone. 由所披露的眼科装置材料构造的IOL可具有能够被卷起或折叠成可以通过一个相对较小的切口装配的一个小横截面的任何设计。  The configuration of IOL materials disclosed ophthalmic device may be of any design capable of being rolled or folded so as to be a relatively small incision by assembling a small cross section. 例如，IOL可具有所谓的单件式或多件式设计。 For example, IOL may have a so-called one-piece or multi-piece design. 典型地，一个IOL包括一个光学元件和至少一个触觉件。 Typically, an IOL comprises an optical element and at least one haptic. 该光学元件是充当透镜的那一部分，并且这些触觉件被附接到该光学元件上，并且像是将该光学元件固持在眼睛中的其适当位置的臂。 The optical element is to act as a lens that part, and the haptics are attached to the optical element, and an optical element such as the retaining arm in its proper position in the eye. 该光学元件和一个或多个触觉件可以具有相同的或不同的材料。 The optical element and one or more haptic elements may have the same or different materials. 因为该光学元件和一个或多个触觉件是分开制造的且然后这些触觉件被附接到该光学元件上，所以称为一种多件式透镜。 Since the optical element and one or more haptics are manufactured separately and then the haptics are attached to the optical element, so it called a multi-piece lens. 在一种单件式透镜中，该光学元件和这些触觉件由一片材料形成。 In a single piece lens, the optical element and haptic elements formed of such a material. 取决于材料，然后从该材料切割或车削出这些触觉件以便产生I0L。 Depending on the material, and then to produce I0L from the material cut or lathed, out of the haptics. 除了IOL之外，本发明的这些眼科装置材料也适合用于其他装置中，这些装置包括隐形眼镜、角膜假体、角膜内透镜、角膜嵌体或环、以及青光眼过滤装置。  In addition to the IOL, the ophthalmic device materials of the present invention are also suitable for other devices, these devices include contact lenses, corneal prosthesis, intracorneal lenses, corneal inlays or rings, and glaucoma filtration devices. 这些装置材料可以用于形成具有低表面粘性和高折射率的眼内透镜。  These means may be used for materials formed in the intraocular lens having a low surface tack and a high refractive index. 由这些材料制成的透镜是柔性的和透明的，可以通过一个相对小的切口插入到眼睛中，并且在插入后恢复其原始形状。 Lenses made of these materials are flexible and transparent, can be inserted into the eye through a relatively small incision, and after insertion to restore its original shape. 其中处于完全水合状态的该眼科装置材料具有:小于20°C的玻璃化转变温度、在589nm和室温(23°C ± 3°C)下测量的大于1.50的折射率、在从16°C至45°C的温度下按重量计小于4.5 %的平衡水含量、特征在于不具有明场微液泡和每个观察屏约10个或更少个微液泡的抗闪光性、从约I. OMPa至约60. OMPa的杨氏模量、大于90%的断裂伸长率和小于6. OMPa的25%割线模量。 The ophthalmic device materials  wherein in a fully hydrated state having: a glass transition temperature of less than of 20 ° C, measured at 589nm under room temperature (23 ° C ± 3 ° C) refractive index greater than 1.50, from 16 equilibrium water content at temperature ° C to 45 ° C of less than 4.5% by weight, and wherein no micro-bubble and having a bright field observation of each panel of about 10 or less anti-glare properties of the micro-bubble, from about I Young's modulus. to about 60. OMPa OMPa is, greater than 90% and an elongation at break of less than 25% 6. OMPa secant modulus. 3.根据发明1或2所述的眼科装置材料，其中处于该完全水合状态的该装置材料在10年加速老化(在平衡盐溶液中90°C，81天)之后具有约30CCT或更低的表面光散射。 The device materials  The ophthalmic device material according to the invention 12, wherein in the fully hydrated state of accelerated aging in about 10 years or after 30CCT (90 ° C, 81 days balanced salt solution) the lower surface of the light scattering. 4.根据发明1至3中任一项所述的眼科装置材料，其中在化学式（I)中，8:是(Qfe) mi，ml是2-5，Υι不存在或是0，wl是0或1，并且Di是H。  The invention according to any of 1 to 3 according to an ophthalmic device material, wherein in formula (I), 8: is (Qfe) mi, ml is 2-5, Υι is absent or 0, wl is 0 or 1, and Di is H.
 5.根据发明1至4中任一项所述的眼科装置材料，其中所述一种或多种芳基丙烯酸单体是：丙烯酸2-乙基苯氧基酯；甲基丙烯酸2-乙基苯氧基酯；丙烯酸苯酯；甲基丙烯酸苯酯;丙烯酸苄酯；甲基丙烯酸苄酯;丙烯酸2-苯基乙酯；甲基丙烯酸2-苯基乙酯;丙烯酸3-苯基丙酯；甲基丙烯酸3-苯基丙酯；丙烯酸4-苯基丁酯；甲基丙烯酸4-苯基丁酯；丙烯酸4-甲基苯酯；甲基丙烯酸4-甲基苯酯；丙烯酸4-甲基苄酯；甲基丙烯酸4-甲基苄酯；丙烯酸2-2-甲基苯乙酯；甲基丙烯酸2,2_甲基苯乙酯；丙烯酸2,3_甲基苯乙酯；甲基丙烯酸2,3_甲基苯乙酯；丙烯酸2,4_甲基苯乙酯；甲基丙烯酸2,4_甲基苯乙酯；丙烯酸2-(4-丙基苯基）乙酯；甲基丙烯酸2- (4-丙基苯基）乙酯;丙烯酸2- (4- (1-甲基乙基)苯基）乙酯；甲基丙烯酸2- (4-(1-甲基乙基)苯基）乙酯;丙烯酸2-(4-甲氧基苯基）乙酯；甲基丙  The 1-4 ophthalmic device material according to any, wherein the one or more aryl acrylic monomers invention are: ethyl acrylate, 2-phenoxyethyl acrylate; methacrylic 2 - phenoxy ethyl acrylate; phenyl acrylate; phenyl methacrylate; benzyl acrylate; benzyl methacrylate; 2-phenylethyl acrylate; methacrylate, 2-phenylethyl methacrylate; acrylate, 3-phenyl- propyl group; 3-phenyl-propyl methacrylate; 4-phenyl-butyl acrylate; 4-phenyl-butyl methacrylate; acrylate, 4-methylphenyl acrylate; methyl methacrylate, phenyl methacrylate; 4-methylbenzyl acrylate esters; methacrylate, 4-methylbenzyl methacrylate; 2-2- methyl benzyl methacrylate; methyl methacrylate, phenyl methacrylate 2,2_; methylphenyl acrylate 2,3_ ethyl acrylate; methyl methacrylate, phenyl methacrylate 2,3_; benzyl acrylate, methyl methacrylate 2,4_; 2,4_ methyl methacrylate, phenyl methacrylate; acrylate, 2- (4-propylphenyl ) ethyl; methacrylate, 2- (4-propylphenyl) ethyl methacrylate; acrylate, 2- (4- (1-methylethyl) phenyl) ethyl; methacrylate, 2- (4- (1 - methylethyl) phenyl) ethyl; 2- (4-methoxyphenyl) ethyl; methylpropan 酸2-(4-甲氧基苯基）乙酯；丙烯酸2- (4-环己基苯基）乙酯；甲基丙烯酸2- (4-环己基苯基）乙酯；丙烯酸2- (2-氯苯基）乙酯；甲基丙烯酸2-(2-氯苯基）乙酯;丙烯酸2-(3-氯苯基）乙酯；甲基丙烯酸2-(3-氯苯基）乙酯；丙烯酸2-(4-氯苯基）乙酯；甲基丙烯酸2-(4-氯苯基）乙酯；丙烯酸2-(4-溴苯基）乙酯；甲基丙烯酸2- (4-溴苯基）乙酯；丙烯酸2- (3-苯基苯基）乙酯；甲基丙烯酸2- (3-苯基苯基）乙酯;丙烯酸2-(4-苯基苯基）乙酯；甲基丙烯酸2-(4-苯基苯基）乙酯;丙烯酸2-(4-苄基苯基）乙酯；甲基丙烯酸2-(4-苄基苯基）乙酯;丙烯酸2-(苯硫基）乙酯；甲基丙烯酸2-(苯硫基）乙酯；丙烯酸2-苄氧基乙酯；丙烯酸3-苄氧基丙酯；甲基丙烯酸2-苄氧基乙酯；甲基丙烯酸3-苄氧基丙酯；丙烯酸2-[2-(节氧基）乙氧基]乙酯；甲基丙烯酸2-[2-(节氧基）乙氧基]乙酯;或其组合。 Acid 2- (4-methoxyphenyl) ethyl methacrylate; acrylate, 2- (4-phenyl-cyclohexyl) ethyl; methacrylate, 2- (4-cyclohexylphenyl) ethyl methacrylate; acrylate, 2- (2 - chlorophenyl) ethyl; methacrylate, 2- (2-chlorophenyl) ethyl methacrylate; acrylate, 2- (3-chlorophenyl) ethyl; methacrylate, 2- (3-chlorophenyl) ethyl ; 2- (4-chlorophenyl) ethyl; methacrylate, 2- (4-chlorophenyl) ethyl; 2- (4-bromophenyl) ethyl; methacrylate, 2- (4- bromophenyl) ethyl; acrylate, 2- (3-phenylphenyl) ethyl acrylate; methacrylate, 2- (3-phenylphenyl) ethyl methacrylate; acrylate, 2- (4-phenylphenyl) ethyl ; methacrylate, 2- (4-phenylphenyl) ethyl methacrylate; acrylate, 2- (4-benzyl-phenyl) ethyl; methacrylate, 2- (4-benzyl-phenyl) ethyl methacrylate; acrylate, 2- (phenylthio) ethyl; methacrylate, 2- (phenylthio) ethyl; 2-benzyloxy-ethyl acrylate; 3-benzyloxy-propyl acrylate; 2-benzyloxy-ethyl methacrylate; 3-benzyloxy-propyl methacrylate; 2- [2- (section) ethoxy] ethyl; methacrylate, 2- [2- (section) ethoxy] ethyl ester; or a combination thereof. 6.根据发明1至5中任一项所述的眼科装置材料，其中所述一种或多种芳基丙烯酸单体是:丙烯酸2-苯基乙酯;丙烯酸3-苯基丙酯;丙烯酸4-苯基丁酯;丙烯酸5-苯基戊酯;丙烯酸2-苄氧基乙酯;丙烯酸3-苄氧基丙酯;或其组合。  The ophthalmic device material according to the invention of claim 1 to 5, wherein the one or more aryl acrylic monomers are: 2-phenylethyl acrylate; acrylate, 3-phenylpropionate ester; 4-phenyl-butyl acrylate; 5-phenyl-pentyl acrylate, methacrylate; 2-benzyloxy-ethyl; 3-benzyloxy-propyl acrylate; or a combination thereof. 7.根据发明1至6中任一项所述的眼科装置材料，其中该可聚合组合物包含按重量计从约54%至约75% (更优选从约60%至约70%)的所述一种或多种具有化学式⑴的芳基丙烯酸单体。  The 1-6 ophthalmic device material according to any one of, wherein the polymerizable composition comprises by weight from about 54% to about 75% (more preferably from about 60% to about 70% of invention ) of said one or more formula ⑴ aryl acrylic monomers. 8.根据发明1至7中任一项所述的眼科装置材料，其中该可聚合组合物包含按重量计从约20%至约30% (更优选从约22.5%至约27.5%)的N，N二甲基丙烯酰胺。  8. 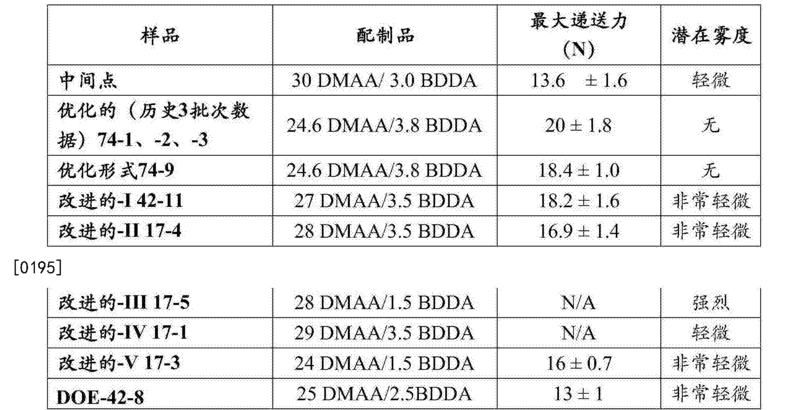 The ophthalmic device material according to the invention 1 to 7, wherein the polymerizable composition comprises by weight from about 20% to about 30% (more preferably from about 22.5% to about 27.5% ) in N, N-dimethylacrylamide. 9.根据发明1至8中任一项所述的眼科装置材料，其中组分(a)和(b)的量的总和是按重量计至少约85% (更优选按重量计至少约90%)。  1 to 8, according to at least about 85% (more preferably an ophthalmic device material according to any sum and wherein the amount of the (b) component (a) of the invention by weight by weight of at least about 90%). 10.根据发明1至9中任一项所述的眼科装置材料，其中该可聚合组合物包含按重量计从约1.0 %至约6.0 %，优选按重量计从约1.5 %至约5.0 %，更优选按重量计从约2.0%至约4.0 %的可聚合的交联剂。  10. The ophthalmic device material according to the invention in any of 1 to 9, wherein the polymerizable composition comprises by weight from about 1.0% to about 6.0%, by weight, preferably from about 1.5% to about 5.0% by weight, more preferably from about 2.0% to about 4.0% of a polymerizable cross-linking agent. 11.根据发明10所述的眼科装置材料，其中该可聚合交联剂选自下组，该组由以下各项组成：乙二醇二甲基丙烯酸酯；二乙二醇二甲基丙烯酸酯;三乙二醇二甲基丙烯酸酯；四乙二醇二甲基丙烯酸酯；甲基丙烯酸烯丙酯；1，3_丙二醇二甲基丙烯酸酯;2,3_丙二醇二甲基丙烯酸酯；1，6_己二醇二甲基丙烯酸酯；1，4_丁二醇二甲基丙烯酸酯；乙二醇二丙烯酸酯;二乙二醇二丙烯酸酯;三乙二醇二丙烯酸酯；四乙二醇二丙烯酸酯;丙烯酸烯丙酯；1，3-丙二醇二丙烯酸酯;2，3-丙二醇二丙烯酸酯；1，6-己二醇二丙烯酸酯；1，4-丁二醇二丙烯酸酯;N，N' -六亚甲基双丙烯酰胺;N，N' -六亚甲基双甲基丙烯酰胺;N，N' -二羟基亚乙基双丙烯酰胺;N，N' -二羟基亚乙基双甲基丙烯酰胺;N，N' -亚甲基双丙烯酰胺;N，N' -亚甲基双甲基丙烯酰胺；CH2 = C (CH3) C (=0) 0- (CH2CH2O) PC (=0) C (CH3) = CH  11. The ophthalmic device material according to the invention 10, wherein the polymerizable cross-linking agent is selected from the group consisting of: ethylene glycol dimethacrylate; diethylene glycol dimethyl acrylate; dimethacrylate triethylene glycol; tetraethylene glycol dimethacrylate; allyl methacrylate; 1,3_ glycol dimethacrylate; 2,3_ glycol dimethacrylate acrylate; 1,6_ hexanediol dimethacrylate; 1,4_ butanediol dimethacrylate; ethylene glycol diacrylate; diethylene glycol diacrylate; triethylene glycol diacrylate ester; tetraethylene glycol diacrylate; allyl methacrylate; 1,3-propanediol diacrylate; 2,3-propylene glycol diacrylate; 1,6-hexanediol diacrylate; 1,4-butylene glycol diacrylate; N, N '- hexamethylene bis acrylamide; N, N' - hexamethylene bis methacrylamide; N, N '- dihydroxy ethylene bis acrylamide; N, N '- dihydroxy ethylene bis methacrylamide; N, N' - methylene bis acrylamide; N, N '- methylene bis methacrylamide; CH2 = C (CH3) C (= 0) 0- (CH2CH2O) PC (= 0) C (CH3) = CH 2，其中p = 1 -50; CH2 = CHC( = 0) 0- (CH2CH2O) pC ( = 0) CH = CH2，其中P = 1-50; CH2 = C (CH3) C (=0) 0 (CH2) t〇-C ( = 0) C(CH3) = CH2，其中t = 3-20; CH2 = CHC (=0) 0 (CH2) t〇-C (=0) CH=CH2，其中t = 3-20，以及其组合(优选选自下组，该组由以下各项组成：1，6_己二醇二丙烯酸酯、1，4_丁二醇二丙烯酸酯、N，N' -六亚甲基双丙烯酰胺、以及其组合）。 2, wherein p = 1 -50; CH2 = CHC (= 0) 0- (CH2CH2O) pC (= 0) CH = CH2, where P = 1-50; CH2 = C (CH3) C (= 0) 0 ( CH2) t〇-C (= 0) C (CH3) = CH2, where t = 3-20; CH2 = CHC (= 0) 0 (CH2) t〇-C (= 0) CH = CH2, where t = 3-20, and combinations thereof (preferably selected from the group consisting of: hexanediol diacrylate 1,6_, 1,4_-butanediol diacrylate, N, N '- six methylene-bis-acrylamide, and combinations thereof). 12.根据发明1至11中任一项所述的眼科装置材料，其中组分(a)和(b)的量的总和是按重量计至少约85% (更优选按重量计至少约90%)。  12. The ophthalmic device material of 1 to 11, in any one invention, wherein the total amount of the components (a) and (b) are by weight, at least about 85% (by weight, more preferably at least about 90%). 13.根据发明1至12中任一项所述的眼科装置材料，其中处于该干燥状态的该眼科装置材料具有大于25°C (更优选从约28°C至约40°C)的玻璃化转变温度。 The ophthalmic device material  13. The ophthalmic device material according to the invention is 1 to 12, wherein in the dry state is greater than 25 ° C (more preferably from about 28 ° C to about 40 ° C) the glass transition temperature. 14.根据发明1至13中任一项所述的眼科装置材料，其中处于该完全水合状态的该眼科装置材料具有小于18°C (更优选小于15°C)的玻璃化转变温度。 The ophthalmic device material  14. The ophthalmic device materials of the invention 1 to 13 in any one of claims, wherein in the fully hydrated state, has a glass transition temperature less than 18 ° C (more preferably less than 15 ° C) of . 15.根据发明1至14中任一项所述的眼科装置材料，其中处于该完全水合状态的该眼科装置材料具有在589nm和室温(23°C ±3°C)下测量的大于1.51 (更优选大于1.52)的折射率。 The ophthalmic device material  15. The ophthalmic device material of the invention of any one of 1 to 14, wherein in the fully hydrated state as measured at 589nm and having a room temperature (23 ° C ± 3 ° C) of greater than a refractive index of 1.51 (more preferably greater than 1.52) in. 16.根据发明1至15中任一项所述的眼科装置材料，其中处于该完全水合状态的该眼科装置材料具有在从16°C至45°C的温度下按重量计从约1 %至约4.2% (更优选从约1.5 %至约3.9 %)的平衡水含量。  16. The invention according to any one of 1 to 15 according to an ophthalmic device material, wherein the ophthalmic device material is in the fully hydrated state having a temperature of from 16 ° C to 45 ° C by weight from about 1% to about 4.2% (more preferably from about 1.5% to about 3.9%) equilibrium water content. 17.根据发明1至16中任一项所述的眼科装置材料，其中处于该完全水合状态的该眼科装置材料具有从约2. OMPa至约55. OMPa (更优选从约3. OMPa至50. OMPa)的杨氏模量。 The ophthalmic device material  17. The ophthalmic device material according to the invention of claim 1 to 16, wherein in the fully hydrated state having from about 2. OMPa to about 55. OMPa (more preferably from about 3. to 50. a OMPa OMPa) Young's modulus. 18.根据发明1至17中任一项所述的眼科装置材料，其中处于该完全水合状态的该眼科装置材料具有至少约100% (更优选至少约110%)的断裂伸长率。 Elongation at break of the ophthalmic device material  18. The ophthalmic device material according to the invention is 1 to 17, wherein in the fully hydrated state of at least about 100% (more preferably at least about 110%) of . 19.根据发明1至18中任一项所述的眼科装置材料，其中处于该完全水合状态的该眼科装置材料具有约5.5MPa或更低(更优选约5.OMPa或更低）的25%割线模量。 The ophthalmic device material  19. The ophthalmic device material according to the invention of 1 to 18, wherein in the fully hydrated state of about 5.5MPa or less (more preferably about or less 5.OMPa) 25% secant modulus. (ii)按重量计从约1 %至约5 % (优选按重量计从约2 %至约5%，更优选按重量计从约2%至约4%)的一种具有化学式（II)的含聚（乙二醇）的可聚合组分。  (ii) by weight of from about 1% to about 5% (by weight, preferably from about 2% to about 5%, more preferably by weight, from about 2% to about 4%) having the formula A (II) containing poly (ethylene glycol) polymerizable component. (iii)其组合。  (iii) a combination thereof. 21.根据发明20所述的眼科装置材料，其中该具有化学式（II)的含PEG可聚合组分具有2，000-10，000道尔顿、优选2，000-8，000道尔顿、更优选2，000-6，000道尔顿、以及最优选2，500-6，000道尔顿的数均分子量。  21. The ophthalmic device material according to the invention 20, comprising a chemical having the formula wherein (II) is PEG having a polymerizable component 2,000-10,000 daltons, preferably 2,000 to 8,000 Road Dalton, more preferably between 2,000 and 6,000 Daltons, and most preferably the number average molecular weight of 2,500-6,000 Daltons. 22.根据发明1至21中任一项所述的眼科装置材料，其中该可聚合组合物包含一种可聚合的UV吸收剂。  22. The invention is 1 to 21 ophthalmic device material according to any, wherein the polymerizable composition comprises one polymerizable UV absorber. 23.根据实施例1至21中任一项所述的眼科装置材料，其中该可聚合的UV吸收剂是2- (2H-苯并[d] [1，2，3]三唑-2-基)-4-甲基-6- (2-甲基烯丙基)苯酚、N- [2-[4-羟基-3- [2-(2-甲基苯基)二氮烯基]苯基]乙基]甲基丙烯酰胺、或其组合。  23. The ophthalmic device material according to any one of claims 1 to Example 21, wherein the polymerizable UV absorber is 2- (2H- benzo [d] [1,2,3] triazole 2-yl) -4-methyl-6- (2-methylallyl) phenol, N- [2- [4- hydroxy-3- [2- (2-methylphenyl) diazenyl yl] phenyl] ethyl] methacrylamide, or a combination thereof. 24.—种眼内透镜，包括根据发明1至23中任一项所述的眼科装置材料或基本上由根据发明1至23中任一项所述的眼科装置材料组成。  Species 24.- intraocular lenses, the invention comprises 1 to 23 ophthalmic device material according to the invention or according to substantially the ophthalmic device material of one of claims 1 to 23 depending on the composition. 25.—种湿式封装的眼内透镜，包括根据发明1至23中任一项所述的眼科装置材料或基本上由根据发明1至23中任一项所述的眼科装置材料组成。  The intraocular lens 25.- species wet package, comprising 1 to 23 invention, the ophthalmic device or material according to one of the ophthalmic device consisting essentially of material according to the invention of claim 1 to 23 consisting of . 先前的披露内容将使本领域的普通技术人员能够实践本发明。  The previous disclosure will enable those skilled in the art to practice the invention. 为了更好地使读者理解具体实施例以及其优点，提出参考以下非限制性实例。 In order to better enable the reader to be understood that the specific embodiments and the advantages thereof, reference to the following proposed non-limiting examples. 然而，以下实例不应被认为限制本发明的范围。 However, the following examples should not be considered as limiting the scope of the present invention. 为了改进预释放性能，将所有SN60WF模具在铸造前用氩等离子体(AST RF等离子体室)处理。  In order to improve the pre-release properties, all SN60WF mold treated with argon plasma (AST RF plasma chamber) prior to casting. 等离子体室参数是60瓦特的正向功率、300毫托的压力和IOOml/分钟的气体流速。 The plasma chamber parameter is forward power 60 watts, 300 mTorr and IOOml / minute gas flow rate. 将模具处理15秒，且然后在铸造之前在工作台上放置正好30分钟。 The mold for 15 seconds and then placed on a table just 30 minutes prior to casting. 首先将配制品用氮气吹扫1分钟，且然后在真空下脱气30秒以便除去任何气泡。  First, the formulation was purged with nitrogen for 1 minute, 30 seconds and then degassed to remove any air bubbles in vacuo. 将它们在铸造过程中通过具有0.2-μπι孔径和任选地1. 〇-μπι孔径的PTFE过滤器进行过滤，并且每组花费大约10分钟来铸造。 They will be filtered through a 0.2-μπι pore size PTFE filter and optionally 1-μπι square aperture in the casting process, and takes approximately 10 minutes each casting. 将所有透镜置于保持在105°C的预热烘箱中，且然后在105°C下固化3小时。 Holding all lens is placed in a preheated oven at 105 ° C in, and then cured at 105 ° C 3 hours. 由于快速固化不提供良好品质厚片，所以通过在20分钟内将烘箱从环境温度加热到70°C来将来自相同配制品的厚片进行斜坡固化，且固化1小时，然后在20分钟内斜升至105 °C并固化2小时。 Due to the rapid curing does not provide a good quality slab, so for the ramp cured by 20 minutes the oven was heated from ambient temperature to 70 ° C to from the same formulation slabs and cured for 1 hour, and then ramp over 20 minutes raised to 105 ° C and cured for 2 hours. 在室温、连续搅拌下将具有<30 % (重量份)DMAA的配制品萃取在丙酮中。 At room temperature, under continuous stirring with <30% and extracted formulation (parts by weight) in acetone DMAA. 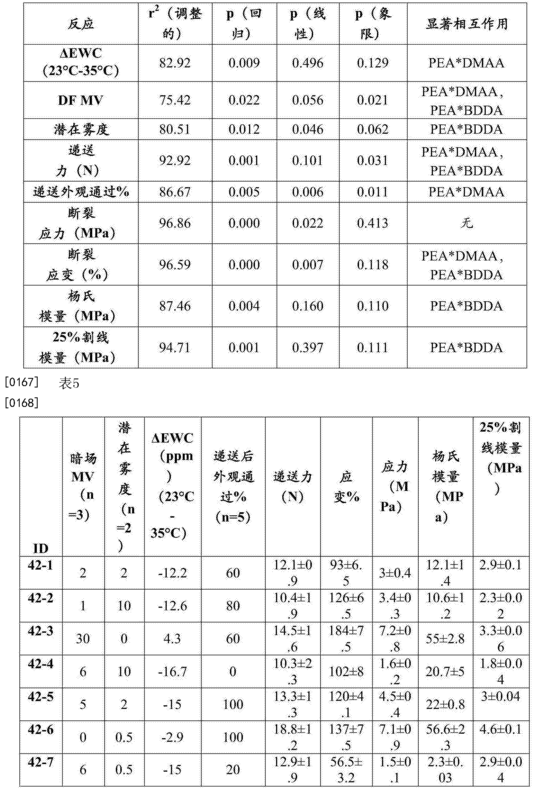 将具有彡30 % (重量份)DMMA的样品萃取在甲醇中。 The sample was extracted with 30% San (parts by weight) in methanol DMMA. 因为，一旦浸入丙酮中，具有35 %(重量份)和40% (重量份)DMAA的样品就开裂。 Because, once immersed in acetone, with a 35% (parts by weight) and 40% (by weight) sample of DMAA to cracking. 萃取循环包括三次1小时浸泡和一次最后冲洗。 Extraction cycle including three one hour soaking and a final rinse. 然后将样品空气干燥24小时，且然后在70°C下真空干燥另外24小时。 The sample was then air-dried for 24 hours, and then dried in vacuo at 70 ° C for a further 24 hours. 测量透镜和厚片的可萃取物。 Measuring a lens thickness and sheet extractables. 为了降低称重误差的可能性，将所有透镜一起称重(记录在甲醇和丙酮中的溶胀比和可萃取物百分比）。 To reduce the likelihood of weighing errors, all the lens weighed together (and percentage recorded in methanol and acetone extractables swell ratio). 将所有样品在120psi压力和120°C下在小瓶中在平衡盐溶液(BSS)中高压蒸汽处理30分钟。  All samples in high pressure balanced salt solution (BSS) at 120 ° C and 120psi pressure steam in a vial for 30 minutes. 在脱模之前，检查所有SN60WF模具以便确定已经从它们的模具预释放的透镜的数量。  Before release, all check SN60WF molds to determine the number of already pre-released lenses from their molds. 由经培训来使用标准检验方法的人员进行检查。 By trained to use standard methods of personnel. 将SN60WF透镜脱模，并冲压出光学元件。  The release SN60WF lens, an optical element and punched. 然后将它们置于微管中并提交用于清洗评估。 They were then placed in a microtube and submitted for cleaning evaluation. 针对再现性研究的测试，一种45 °C至37 °C Δ T明场微液泡测试。  Study of the reproducibility of the test for a 45 ° C to 37 ° C Δ T micro bubble bright field test. 通过狭缝灯检查SN60WF透镜以便评估表面雾度。  SN60WF by slit lamp examination in order to evaluate the lens surface haze. 在透镜已经在BSS中水合24小时后进行测试。 After the lens has been tested for 24 hours in the BSS hydration. 以30度角测定每个透镜的后部和前部的峰值雾度强度(PHI)。 Determination of the rear angle of 30 degrees and the peak intensity of each lens haze front portion (PHI). 在用于表面散射和体雾度测试的准备中，在无菌条件下将SN60WF透镜置于充满BSS的单个顶部卷边小瓶中。  In preparation for body surface scattering and haze test, under sterile conditions SN60WF crimp top vials single lens was placed in the BSS filled. 将它们在90°C下老化0、40和81天，这相当于在35°C下老化0、5 和10年。 They 0,40 and 81 days aging at 90 ° C, which corresponds to aging at 35 ° C 0,5 and 10 years. 根据PR0C-0005403通过Nidek EAS 1000斯凯姆普夫拉格(Scheimpflug)进行评价。 The PR0C-0005403 evaluated by Nidek EAS 1000 斯凯姆普夫 La (Scheimpflug). 建立了一种斯凯姆普夫拉格(图像捕获系统以用于IOL的一致表面光散射(SLS)分析。组装了一种专门设计的暗眼模型，该模型将固持正被检查的IOL并且可以在室温下填充空气或平衡盐溶液(BSS，爱尔康实验室有限公司（Alcon Laborat〇ries，Inc. ))。用EAS-1000前段分析系统(尼德克有限公司(Nidek Co.Ltd.))使用以下设置来捕获模型眼和IOL的图像:200W闪光，10. OOmm狭缝长度，0.08mm狭缝宽度，以及距光束路径45度的一个固定相机角度位置。在从〇(最低强度)到255 (最高强度)范围内的计算机兼容磁带(CCT)单元中测量表面光散射光密度测定。沿着垂直于IOL光学元件的中心交叉的线的轴线测量IOL的前表面和后表面的SLS光密度测定值。在中心3.Omm视区内沿着3条线的轴线测量前表面和后表面的峰值散射强度，从而得到每个IOL 6个测量值，然后求这些测量值的平均值。在IOL干燥、润  established a 斯凯姆普夫 La (image capturing surface of the IOL system for uniform light scattering (SLS) analysis assembled dark eye model specially designed holding the model being examined IOL and may be filled with air or a balanced salt solution (BSS, Alcon laboratories, Inc. (Alcon Laborat〇ries, Inc.)) at room temperature with the pre-stage EAS-1000 analytical system (Nidek Co., Ltd. (Nidek Co. Ltd.'s)) using the following settings to capture the image of the model eye and an IOL: 200W flash, 10 OOmm slit length, the slit width of 0.08mm, and a beam path from a fixed position of the camera angle 45 degrees from square (lowest. intensity) to computer 255 (highest intensity) range compatible tape (CCT) unit measuring surface of the optical density of the light scattering front surface axis measurement IOL in the center IOL optic intersecting along a vertical line and the rear surface of the SLS measured optical density in the central region along the axis of view 3.Omm measuring a front surface and rear surface of the scattering intensity peaks of three lines, whereby each IOL 6 measurements, then averaging these measured values. in IOL dry run (在平衡盐溶液中大约2分钟后)和水合(在平衡盐溶液中24小时后)情况下测量表面光散射。 And hydrated (after 24 hours in a balanced salt solution) (Measured after about 2 minutes in a balanced salt solution) surface of the light scattering. 将五个NG2001网状透镜提交给IOL递送测试组。  The five NG2001 reticular lens IOL delivery submitted to the test group. 在匹配标准AcrySof循环的功率和压力条件下将这些透镜用1分钟等离子体循环进行等离子体处理。 In the matching criteria AcrySof cycle power and pressure conditions of these plasma treated lenses plasma 1 minute cycle. 用1.5-mm聚碳酸酯NGIOL递送系统进行递送测试。 The delivery system with 1.5-mm polycarbonate test NGIOL delivered. 如下对于来自每种配制品的2个IOL进行通过莫纳克(Monarch) -III D盒的注射递送测试。  Monarch as by injection (Monarch) -III D box test for two IOL delivery from each formulation. 打开莫纳克-III D盒，并填充Viscoat。 Open boxes Monarch -III D, and filled Viscoat. 根据盒使用说明书，将来源于配制品的一个40D SA60AT IOL (在40个Dioper模具中铸造的I0L)负载到盒中。 The cartridge Manual, 40D SA60AT IOL derived from a formulation (40 Dioper cast in a mold I0L) loaded into the cassette. 将盒置于莫纳克-III D手持件中，并将柱塞推进到螺钉激活点，且然后进一步缓慢推进直到IOL被接合。 The cassette was placed in the handpiece Monarch -III D, and the advancement of the plunger to the activation point of the screw, and then further advanced until the IOL is slowly engaged. 将IOL推进通过盒尖端并且进入一盘水中。 The IOL is advanced through the tip and into a cartridge water. 观察IOL以便确定光学元件展开时间和触觉件从该光学元件完全释放的时间。 IOL observed to determine optical element and the deployment time of the time of the haptic member completely released from the optical element. 此外，在30x放大率下在显微镜下针对在注射时发生的任何损伤观察I0L。  Further, at 30x magnification under a microscope I0L observed for any damage occurring during injection. 同样，针对在尖端的顶点处的应力斑痕或任何断裂观察盒尖端。 Similarly, the cartridge tip for the observed stress at the tip or apex of any scar rupture. 如果没有观察到IOL损伤或盒尖端损伤，则递送被认为通过。 If no damage is observed IOL cartridge or tip damage, the delivery is considered passed. 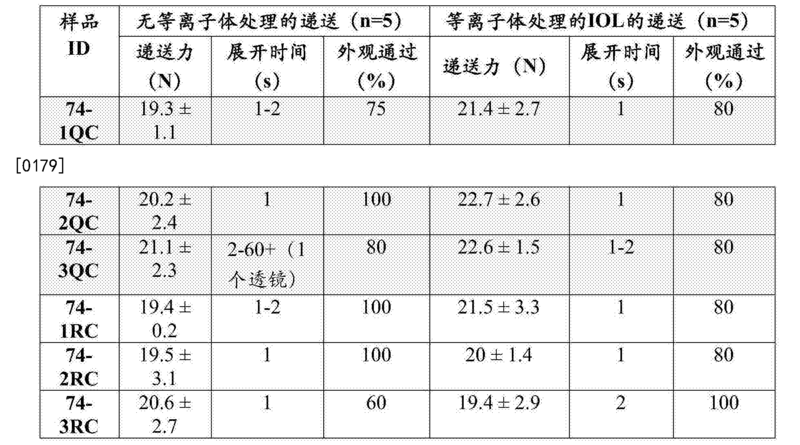 IOL或尖端损伤意味着递送运行失败。 IOL delivery or tip damage means fail. 为了测定所得材料的拉伸性质，从所测试的每种材料的厚片样品切割8-12个微型狗骨形，在微量离心小瓶中在BSS中水合，并且在水浴中平衡至18°C。  To determine the tensile properties of the resulting material, the slab cut from each sample material tested 8-12 miniature dogbone, hydration in the BSS microcentrifuge vial, and equilibrated in a water bath to 18 ° C. 使用Biopuls环境室进行温度受控的拉伸测试，该环境室安装在英斯特朗5943材料试验机上。 Using a temperature-controlled environmental chamber Biopuls tensile testing, environmental chamber mounted on the Instron 5943 testing machine. 经由循环温度控制的水浴将Biopuls室调节至18°C。 Circulating temperature controlled water bath through the chamber is adjusted to the Biopuls 18 ° C. 就在测试之前，将微型狗骨形从18°C水浴中移除并置于拉伸试验机的十字头中。 It will be removed and miniature dogbone tensile tester crosshead placed in a water bath from 18 ° C prior to testing. 将Biopuls室升高到十字头之上，并且将样品在Biopuls室中进一步平衡2分钟。 Biopuls chamber rises above the crosshead and the sample chamber to further balance in Biopuls 2 minutes. 以50mm/分钟速率将微型狗骨形拉至断裂点以便测量拉伸性质。 At 50mm / min rate miniature dogbone tensile breaking point in order to measure the tensile properties. 从每材料配制品8-12次运行的平均值确定拉伸强度(极限拉伸应力）、断裂伸长率(最大应变）以及杨氏模量和割线模量值。 Determining the tensile strength (ultimate tensile stress) from the average run per formulation materials 8-12, the elongation at break (maximum strain) and the Young's modulus and the secant modulus values. 对透镜进行评价。  The lenses were evaluated. 检验员检查每个透镜并确定表面雾度水平以及透镜是否通过表面雾度和缺陷检查。 Inspector to check each lens surface and determine whether the haze level and a lens surface haze and defects by inspection. 表面雾度水平分级为介于1与5之间的数字，其等同于以下标准：1 =无，2 =非常轻，3 =轻，4=中等，并且5 =重。 Surface haze level rating is a number between 1 and 5, which is equivalent to the following criteria: 1 = none, 2 = very mild, 3 = mild, 4 = moderate, and 5 = severe. 表面雾度通过/失败标准是基于雾度均匀度和水平。 Surface haze pass / fail criteria is based on uniformity and haze levels. 所有5级透镜立即被视为失败。 All five lenses immediately be considered a failure. 如果雾度是均匀的，则在5级以下的任何等级都可以是通过。 If the haze is uniform, any level below the level 5 may be passed. 透镜缺陷检验检查除了表面和嵌入微粒之外，在光学元件中发现的任何可能的缺陷。 Any possible defects in the lens defect inspection and surface inspection in addition to embedded particles, found in the optical element. 如果发现任何缺陷，不论严重程度，透镜将未通过检验。 If you find any defects, regardless of severity, the lens will not pass inspection. 在可萃取物％测定之后，将相同的样品置于玻璃小瓶中，浸入平衡盐溶液(BSS，爱尔康）中，并且置于45°C水浴中至少24小时，然后移除并重新称重以确定平衡水含量(EWC) %。  In the% extractables measured after the same sample was placed in a glass vial, immersed in balanced salt solution (the BSS, Alcon) and placed in a 45 ° C water bath for at least 24 hours, and then removed re-weighed to determine the equilibrium water content (EWC)%. 在少数情况下，通过在MV测试之前和之后称重样品来测定水含量。 In a few cases, the water content was determined by weighing samples before and after the test MV. 通过差示扫描量热法以KTC/分钟测量处于干燥或完全水合状态的材料的玻璃化转变温度(Tg)，并且在热通量曲线的转变中点处确定。  In KTC / min measured in fully hydrated state or dried by differential scanning calorimetry of the glass transition temperature material (Tg), and determines the midpoint of the transition of the heat flux curve. 使用博士伦(Bausch&amp;Lomb)折射计(Cat.#33.46.10)在589nm和35°C下测量这些材料的折射率。  using the Bausch & Lomb (Bausch & amp; Lomb) refractometer (Cat # 33.46.10.) Measuring the refractive index of these materials at 589nm and 35 ° C. 将测试厚片样品在去离子水或BSS中水合至少24小时，吸干，且然后置于样品台上。 The test sample slab or BSS deionized water hydration at least 24 hours, blotted dry, and then placed on the sample stage. 在置于台上的5分钟内取得测量值。 Measurements were taken in the table is placed for 5 minutes. 使用肖特（Schott)KL 2500IXD光源定性地测量潜在雾度。  Use Schott (Schott) KL 2500IXD source potential qualitatively measured haze. 将IOL或矩形测试厚片(IX 2 X 0.1 cm)在BSS中水合至少24小时。 The test IOL or rectangular slabs (IX 2 X 0.1 cm) hydration of at least 24 hours in the BSS. 然后将水合样品浸入35 °C水浴中并以最高强度照射，同时在X、y和z方向上旋转样品以确定潜在雾度的存在。 The hydrated sample was then immersed in 35 ° C water bath and the highest intensity of the irradiation, while rotating the sample in the X, y and z directions to determine the potential haze. 通常，当材料在35°C下5分钟内在去离子水或BSS中变得显著模糊并且在35C浴中保持模糊大于1小时时，水合的材料被认为具有不可接受水平的潜在雾度。 Typically, when the material 5 min at deionised water at 35 ° C or BSS becomes significantly blurred and remains in 35C bath fuzzy than 1 hour, the hydrated material is considered a potential having an unacceptable haze level. 在大多数情况下，雾度不是永久性的，并且分子重新取向导致材料在35°C时变得透明。 In most cases, the haze is not permanent, and the molecular re-orientation results material becomes transparent at 35 ° C. 具有可接受水平的潜在雾度的材料在35°C下加热大约30分钟内通常变得透明。 Potential materials with an acceptable level of haze was heated at 35 ° C often becomes clear within about 30 minutes. 认为没有潜在雾度的材料当置于35°C浴中时，雾度未显示增加。 When the haze that no potential material when placed in bath at 35 ° C, the haze did not show an increase. 使用多纟仑-詹纳(Dolan-Jenner) Fiber-Lite光纤照明器(型号190)在干燥和水合透镜上定性地评定样品透明度。  multi-Lun Si - Jenner (Dolan-Jenner) Fiber-Lite Illuminator Fiber (model 190) on the dried and the hydrated lens qualitatively assess sample transparency. 将水合透镜置于光路中，同时在x、y和z方向上旋转样品以确定相对雾度。 The hydrated lens in the optical path, while rotating the sample in the x, y and z directions to determine the relative haze. 为了确定湿式封装配制品的可用边界，设计了具有相对宽的限制的混合物设计。  In order to determine the boundary wet package available formulations designed mixture having a relatively wide design limitations. 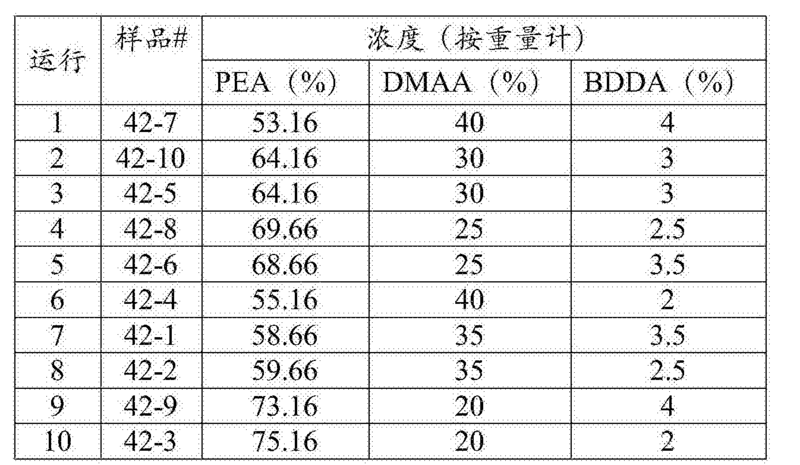 研究了20 %至40 %的DMAA水平和2 %至4 %的BDDA水平，其中在中间点（30 % DMAA与3 %BDDA)进行两次重复。 Study of 20% to 40% level and DMAA BDDA level of 2-4%, which was repeated twice at an intermediate point (30% DMAA and 3% BDDA). 使用Minitab 15统计软件创建和分析混合物DOE。 Minitab 15 Statistical Software created using a mixture of analysis and DOE. 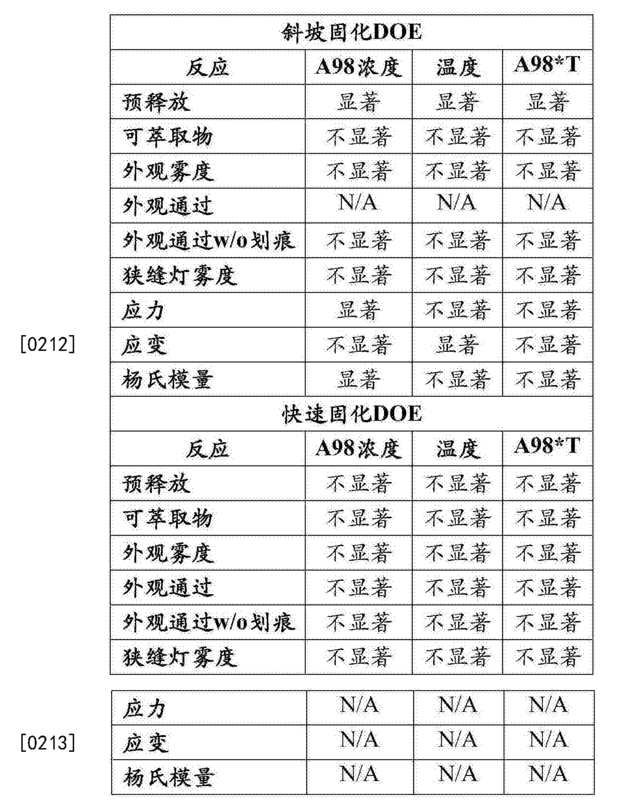 在表1中提供了10个样品全DOE，并且在表2中列出反应。 Providing full DOE 10 samples in Table 1, and the reaction listed in Table 2 below. 所有配制品都含有1 % AIBN、1.8 % oMTP和0.04 %AL8739。 All formulations contain 1% AIBN, 1.8% oMTP and 0.04% AL8739. 将它们在预热至105 °C的烘箱中快速固化3小时。 They cure rapidly to 105 ° C preheated oven for 3 hours. 对于所有运行使用同一烘箱。 For all run using the same oven. 如实例1中所描述将厚片进行斜坡固化。 As described in Example 1 for the ramp cured slab. 将所有透镜用AcrySof循环进行等离子体处理。 All AcrySof lens is plasma treatment cycle. 因为一些高DMAA和高BDDA配制品（42-1、42-4和42-7)没有针对这种反应的任何数据，因此无法分析100%割线模量测量值。  For some of the high and high BDDA formulations DMAA (42-1,42-4 and 42-7) without any data for this reaction, the analysis can not be a 100% secant modulus measurements. 清洗、可萃取物、预释放结果和通过狭缝灯进行的表面雾度测量总结在表3中。  cleaning, extractables, and the results of the pre-release surface haze measurement by a slit lamp are summarized in Table 3. 这些反应未在DOE中使用，因为相应数据在组成上没有变化并且对于所有样品看起来相似。 These reactions are not used in the DOE, since corresponding data does not change in composition and look similar for all samples. 例如，无论样品的组成如何，所有样品均以高成功率(>80%通过)通过了预释放，因为通过晶片等离子体处理防止了预释放。 For example, regardless of the composition of the sample, all samples are high success rates (> 80% through) by the pre-release, because the wafer by the plasma treatment prevents pre-release. 类似地，对于颗粒清洗成功率较高（>80%清洗），因为所有样品在干燥状态下是玻璃状的，从而使得清洗容易。 Similarly, higher success rates for cleaning particles (> 80% clean), because all the samples in the dry state is a glassy, ​​making cleaning easier. 只有42-10(中点配制品之一)确实显示50 %清洗，这主要是由于嵌入颗粒所致。 Only 42-10 (one midpoint formulation) did show a 50% clean, which is mainly due to embedded particles caused. 重要的是要注意，在清洗评估过程中仅研究颗粒去除和雾度。 It is important to note that the study only remove particles and haze in the cleaning assessment process. 未评价其他外观检验如划痕。 Not evaluate other visual inspection such as scratches. 但是，检验员注意到所有样品都有高水平的划痕。 However, inspectors noticed that all samples have a high level of scratches. 最后，对于除了42-9 (30°雾度是约10±9PHI)之外的所有配制品测量到非常低的狭缝灯雾度。 Finally, for all measurements except formulations 42-9 (30 ° haze of about 10 ± 9PHI) to very low haze slit lamp. 然而，这些透镜之一的仅一个表面具有导致具有高标准偏差的高平均值的非常高的雾度约17PHI。 However, only one surface of one of the lenses have very high haze results in a high standard deviation about the mean high 17PHI. 否则，当高值被视为异常值时，则平均雾度将是2 ± 2PHI。 Otherwise, when a high value is considered an outlier, the average haze will be 2 ± 2PHI. 当运行时间DOE时，5年表面散射(SS)和体雾度(BH)结果不可获得。 When the running time DOE, 5 years surface scattering (SS) and bulk haze (BH) results are not obtained. 然而，这未产生DOE结果的显著差异，因为所有样品都具有低SS和BH，除了最低组成角之一(42-3，20 % DMM与2 % BDDA)具有约20CCT SS和约7PHI BH。 However, this is not a significant difference in the results of DOE, since all the samples have a low SS and BH, in addition to the composition of the lowest one angle (42-3,20% DMM with 2% BDDA) having about 20CCT SS about 7PHI BH. 这种特定样品也具有最高的潜在雾度，其用于DOE分析中，如表4中所报告。 This particular sample also having the highest potential haze for DOE analysis, as reported in Table 4. 使用Minitab 15统计软件创建和分析DOE AOE回归分析结果总结在表4中。  regression analysis using Minitab 15 Statistical Software to create and analyze DOE AOE results are summarized in Table 4. 发现暗场MV、潜在雾度、环境温度与35 °C之间的水含量变化、递送力以及外观和拉伸性质显著地取决于组成并用作反应。 The water content was found between the change in the dark-field MV, the potential haze, ambient temperature and 35 ° C, the delivery force and tensile properties, and appearance significantly depending on the composition and used as a reaction. 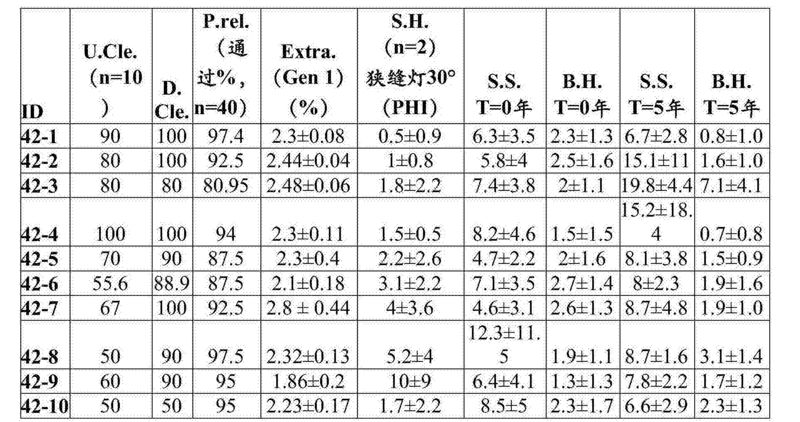 关键结果总结在表5中。 The key results are summarized in Table 5. 潜在雾度观察被定标为0是无，0.5是一点雾度，2是轻微雾度，并且10匹配强烈雾度。 Potential haze was observed no scaling is 0, 0.5 is a little haze slight haze 2, 10 and the matching strong haze. 发现PEA*DMAA和PEA*BDDA之间的相互作用是显著的，但DMAA*BDDA之间的相互作用不显著。 We found that the interaction between PEA * DMAA and PEA * BDDA is significant, but the interaction between DMAA * BDDA not significant. 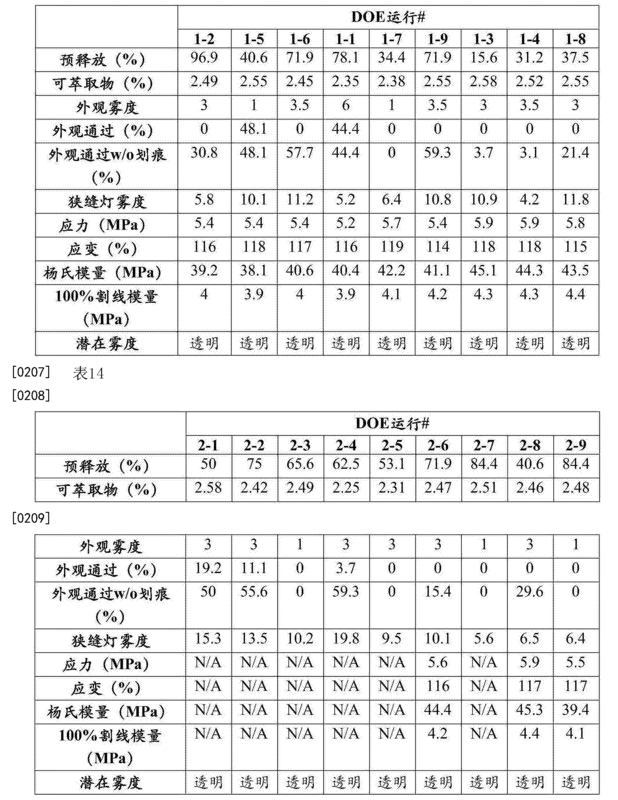 DOE产生了表6中的选定的优化配制品。  DOE produces the selected table 6 in optimized formulations. 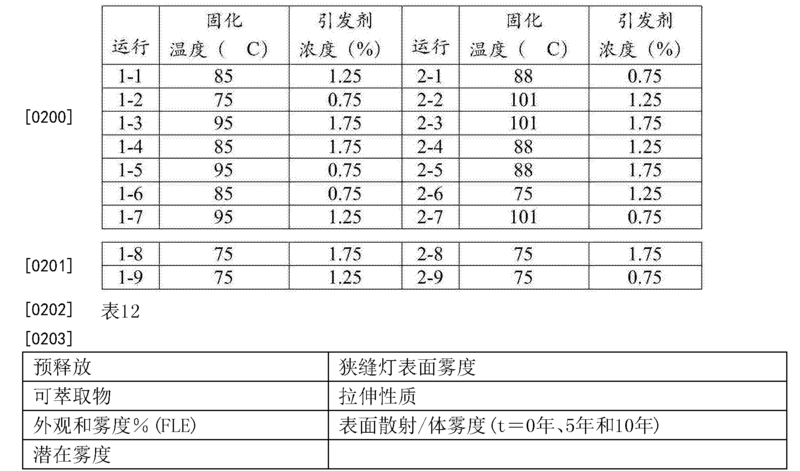 表中所示的优化配制品的结果如下。  Results of optimization of the formulation shown in the table below. EWC%是按重量计3.5% ;水合折射率是1.54;并且完全水合状态下的玻璃化转变温度是11.5°C。 EWC% by weight 3.5%; the refractive index was 1.54 hydration; and a glass transition temperature in a fully hydrated state is 11.5 ° C.
 将以上表6中所示的选定的优化配制品重复三次相同的批次以便确定该配制品是否稳健。  The same batch was repeated three times or more as shown in Table 6 is selected to optimize the formulation in order to determine the soundness of the formulation. 在重复研究中，将配制品批次分成两组，并且将一组热快速固化，同时将另一组热斜坡固化，以便研究固化条件对优化的湿式封装配制品的影响。 In the replication study, the formulation batch was divided in two groups, a group of heat and rapid curing, while the other set of ramps heat curing, to study the effect of curing condition on the optimization of the wet formulation package. 此外，对来自同一批次的等离子体处理的样品和未处理的样品进行递送测试，以便研究是否需要等离子体处理来获得透镜的所希望的展开行为。 Further, the sample treated and untreated plasma samples from the same batch delivered tested to study whether plasma treatment to obtain the desired lens deployment behavior. 表7列出递送结果。  Table 7 shows the results of delivery. 作为参考，配制品42-6(实例2)的DOE运行的递送力是18.8土1.2N。 For reference, the formulations (Example 2) delivery force DOE run is 18.8 42-6 soil 1.2N. 基线(空盒）的最大力范围是16.1-16.2N。 Baseline (empty box) the maximum force range 16.1-16.2N. 优化配制品的所有重复在20N附近具有一致的递送力，20N是漏斗标准的最大值。  Optimization of the maximum value of all repeating a consistent delivery of power in the vicinity 20N, 20N funnel is a standard formulation. 然而，除了30个IOL中的仅一个未经等离子体处理的透镜确实显示60+s展开时间，即使在未经等离子体处理的样品的情况下也未观察到外观问题和触觉件粘附。 However, in addition to the lens 30 of the IOL only a plasma treatment does not display 60 + s expansion time, was not observed and the problem of appearance haptics adhesion even in the case of the sample without plasma treatment. 未观察到喷嘴损坏。 No damage was observed to the nozzle. 优化的湿式封装重复也进行清洗、潜在雾度、预释放、表面散射、体雾度和表面雾度、重量可提取物和暗场MV测试，并且结果总结在表8中。  Optimization of wet washing is also repeated encapsulation, the potential haze, pre-release, surface scattering, bulk haze and surface haze, and the weight can extract the dark-field MV test, and the results are summarized in Table 8. 在15s Ar等离子体处理的Genl晶片情况下预释放没有问题。 In the pre-release Genl 15s Ar plasma processing of the wafer where there is no problem. 对于所有重复未观察到潜在雾度。 Repeat for all potential haze was not observed. 对于6个批次中的4个，可清洗性通常优于60%。 For four of the six batches, generally superior cleanability of 60%. 2个批次的清洗测试确实失败，这大部分是由于嵌入颗粒和极度划痕。 Two washing batches of test indeed fail, due in large part embedded particles and extremely scratches. 对于所有快速固化样品和斜坡固化样品，当在甲醇中萃取时可萃取物是约2% IV性能是良好的。 For all cured samples fast ramp and cured samples, when extracted in methanol extractables is about 2% IV performance is good. 出人意料地，通过在30°下的狭缝灯测量，对于所有样品测量到相对高的表面雾度。 Surprisingly, through a slit lamp at 30 ° measurements, measurements for all samples to a relatively high surface haze. 一种典型的AcrySof透镜具有18PHI的表面雾度水平。 A typical AcrySof lens surface having a haze level of 18PHI. 然而，来自第四批(74-4RC和QC)的η = 6个IOL确实分别显示3.8和3.2ΡΗΙ表面雾度。 However, η from the fourth installment (74-4RC and QC) of the IOL do = 6 and 3.8 are shown 3.2ΡΗΙ surface haze. 此外，所有10个优化DOE样品都具有非常低的表面雾度。 In addition, all optimized DOE 10 samples have very low surface haze. 所有重复的拉伸机械性质被发现彼此相似，并且也被发现可与表9中报告的最接近的DOE样品（42-6，实例2)相比。  Tensile mechanical properties of all duplicate is found similar to each other, and is also found to be closest to the sample DOE reported in Table 9 (42-6, Example 2) compared. 基于所有上述数据，据发现优化的配制品是可重复的、稳健的并且通过了所有标准。  Based on all these data, it was found that the optimized formulation is repeatable, robust and passed all criteria. 与表6中所示的优化配制品相比研究了较高和较低DMAA (24%-30%)和较低交联剂（1.5%-3.5%)水平，以软化材料以便降低递送力(关于配制品，参见表10)。  Compared with the optimized formulation shown in Table 6 were studied in higher and lower DMAA (24% -30%) and lower crosslinker (1.5% -3.5%) level to soften the material in order to reduce delivery force (on formulations, see Table 10). 通常，对于较高DMAA和较低交联剂样品，在操作室温度范围（16°C-25°C)内仅测量到模量的轻微降低。 Typically, the crosslinking agent for the higher and lower DMAA sample chamber within the operating temperature range (16 ° C-25 ° C) measured to only a slight decrease in modulus. 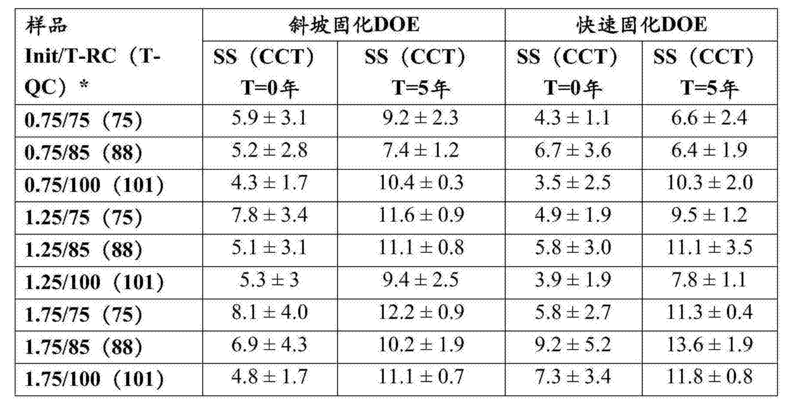 表10报告递送力测量值和潜在雾度评估。 Table 10 reports the delivery force measurement and evaluation of potential haze. 一些改进的配制品如42-11、17-3和4以及42-8 (D0E样品之一）具有比20N更低的递送力。 Some formulations, such as improved 42-11,17-3 and 4 and 42-8 (one D0E sample) having a lower delivery force than 20N. 然后由两名外科医生递送这些改进的配制品。 And then by the two surgeons to improve the delivery of these formulations. 两位外科医生都不能区分优化配制品与改进的配制品的递送性能。 The surgeon can not distinguish between two optimized formulations with improved delivery performance of the formulation. 还对优化的湿式封装配制品进行了引发剂筛选研究。  Screening of further optimization of wet initiator formulations were packaged. 作为引发剂筛选的结果，与AIBN相比，Luperox A98 (过氧化二苯甲酰，Mwt = 242)据发现是湿式封装配制品的更好引发剂，特别是关注在无模具处理情况下的预释放时。 As a result of screening the initiator, as compared with AIBN, Luperox A98 (dibenzoyl peroxide, Mwt = 242) was found to be a better wet encapsulated formulation initiators, particularly those concerned with the mold without pre-processing in a case released. 在所选择的优化配制品和引发剂情况下，团队向前推进了优化的固化和引发剂组合物的选择。  In the optimized formulation chosen and initiator, the selection team forward optimization curing agent composition and the initiator. 由于仅存在两个因素，固化温度和引发剂浓度，所以用全因子设计进行了2个D0E。 Since there are only two factors, the curing temperature and the initiator concentration, it is carried out using two D0E full factorial design. 第一DOE运行用于斜坡固化，且另一个用于快速固化，同时改变Luperox A98浓度(0.75%-1.25%-1.75%)。 DOE run for curing a first ramp, and the other for rapid curing, while changing the concentration of Luperox A98 (0.75% -1.25% -1.75%). 在表11中提供这些D0E，并且在表12中列出反应。 These D0E provided in Table 11, and the reaction are listed in Table 12. 对于斜坡固化，烘箱被编程为在20、34和38分钟内从环境温度达到指定T (75 °C、85 °C或95°C)，分别持续1小时，然后在I〇〇°C下2小时。 For ramp curing oven was programmed from ambient temperature reaches the specified T (75 ° C, 85 ° C or 95 ° C), respectively 20, 34 and 38 continued in minutes 1 hour, and then at 2 ° C I〇〇 hour. 为了快速固化，将烘箱预热至指定温度(75°C、88°C或101°C) 1小时，然后在100°C下2小时。 For rapid curing, oven preheated to a specified temperature (75 ° C, 88 ° C or 101 ° C) 1 hour and then at 100 ° C 2 hours. 这些模具中没有一个进行氩等离子体处理，以便测量作为配制品和固化条件的一部分的实际预释放。 No one of these molds argon plasma treatment, in order to measure the actual pre-release formulations and curing conditions as a part. 使用Minitab 16统计软件程序创建和分析D0E。  created using Minitab 16 Statistical Software program and analysis D0E. 分别在表13和表14中提供了斜坡固化DOE和快速固化DOE的关键分析结果。 Are shown in Tables 13 and Table 14 provides a ramp and a cured DOE key rapid curing of the DOE analysis. 外观FLE检验结果用于三个类别：外观视觉雾度水平、外观通过％和当划痕不被认为是失败时的外观通过％。 FLE appearance test results for three categories: the visual appearance of haze level, and when the scribe% by appearance is not considered a failure by the appearance at%. 此外，一些透镜由于在相对高的温度iorc下快速固化时的气泡形成而失败。 In addition, some of the lenses forming the bubbles rapidly cured at relatively high temperatures iorc fail. 表15总结了两个DOE的帕累托图（Pareto Charts)的结果，给定反应是否受到95%置信水平内的反应的显著影响。  Table 15 summarizes the results of two DOE Pareto chart (Pareto Charts), and given the reaction is subject to significant influence the reaction in the 95% confidence level. 注意，在88°C及以上快速固化未产生优质厚片。 Note that, the slab is not generated in the high 88 ° C and more rapid curing. 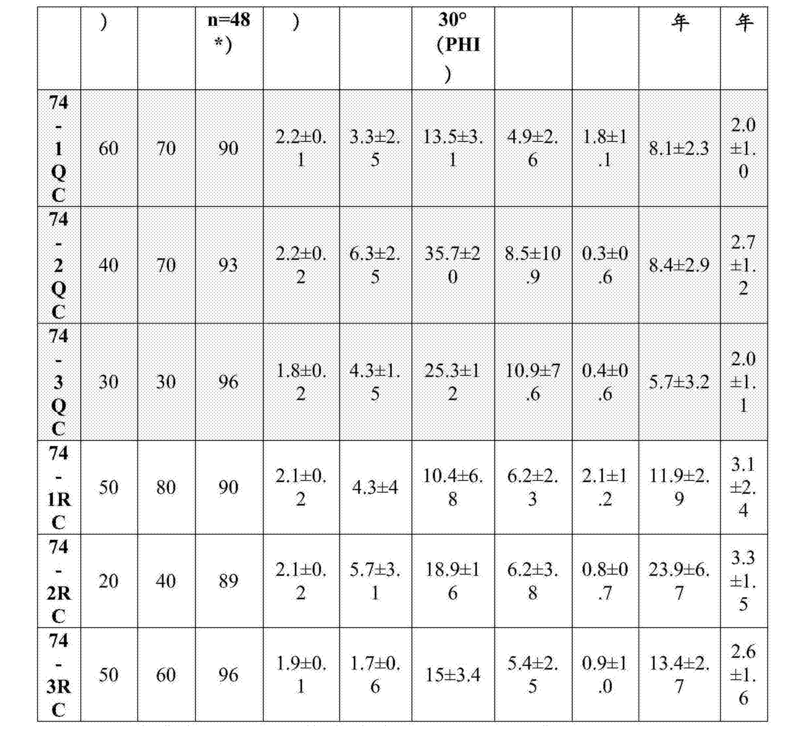 [02 Μ] 表16总结了固化DOE最佳条件。 [02 Μ] Table 16 summarizes the cure conditions optimal DOE. 斜坡固化DOE提供，0.75 %A98和加热至77.5 °C将所希望的条件。 Ramp cure to provide DOE, 0.75% A98 was heated to 77.5 ° C and the desired conditions. 虽然快速固化DOE结果大多数是统计学上不显着的，但数据表明将大约98°C的较高固化温度与1%引发剂浓度组合产生稍微更好的性能。 Although the most rapid curing DOE result was not statistically significant, but the data show that a higher curing temperature of about 98 ° C with a concentration of 1% performance initiator agent composition produced slightly better. 然而，由于在iorc下固化的气泡形成，一些透镜丢失。 However, since the curing at iorc bubble formation, loss of some of the lenses. 5年表面散射(SS)和体雾度(BH)结果刚刚出来并呈现在表17和表18中。 5 years scattering surface (SS) and bulk haze (BH) just come out and the results presented in Tables 17 and 18. 斜坡固化和快速固化两者均显示出类似的SS和BH结果。 Ramp cure and fast cure both show similar results SS and BH. 基于这些结果，推荐在20分钟内从环境温度至77.5 °C持续3小时和0.75 %A98引发剂浓度的斜坡固化。 Based on these results, it is recommended for 3 hours and 0.75% A98 curing initiator concentration ramp from ambient temperature to 77.5 ° C over 20 minutes. 这主要是因为，测量到更好的狭缝灯雾度，并且与可能导致气泡形成的快速固化相比，它产生了厚片。 This is mainly because, more measured haze slit lamp, and may result in comparison with the rapid solidification of bubble formation, which produces a slab. 另外，剩下的性质被发现是类似的。 In addition, the rest of the property was found to be similar. 其中A^H或CH3 (优选H) ; (CH2) ^或[0 (CH2) 2] η，其中ml是2-6并且z 1 是1-10; Y1是直接键、〇、S、或NR'，其中R'是!1、013、&amp;1'!1211'+1(其中11' = 1-10)、异-〇(：3!17、〇5抱、或012〇^5;¥1是0-6，条件是ml+wl 彡8;并且01是!1、Cl、Br、C1-C4 烷基、C1-C4 烷氧基、C6H5、或CH2C6H5， (c) 一种可聚合的交联剂， 其中这些列出的组分和任何另外的可聚合组分总计为按重量计100%， 其中组分（a)和组分（b)的量的总和是按重量计至少约80% (优选按重量计至少约85%，更优选按重量计至少约90%)， 其中处于干燥状态的该眼科装置材料具有大于23°C (优选大于25°C，更优选从约28°C 至约40°C)的玻璃化转变温度， 其中处于完全水合状态的该眼科装置材料具有：小于20°C (优选小于18°C，更优选小于15°C)的玻璃化转变温度、在589nm和室温(23°C ± 3°C)下测量的大于1.50 (优选大于1.51， 更优选大于1.52)的折 Wherein A ^ H or CH3 (preferably H); (CH2) ^ or [0 (CH2) 2] η, ml is 2-6 and where z 1 is 1-10; Y1 is a direct bond, square, S, or NR ', wherein R' is 1,013, & amp; 1 + 1 (11 '= 1-10), iso -〇 (! : 317, 〇5 hold, or 012〇 ^ 5; ¥' 1211! '! 1 is 0-6, provided that ml + wl San 8; and 01 is 1, Cl, Br, C1-C4 alkyl, C1-C4 alkoxy, C6H5, or CH2C6H5, (c) one polymerizable! a crosslinking agent, wherein the listed components and any additional polymerizable component may amount to 100% by weight, wherein the sum of components (a) and the amount of component (b) is at least about 80 by weight % (by weight, preferably at least about 85%, more preferably by weight of at least about 90%), wherein the ophthalmic device material is in a dry state is greater than 23 ° C (preferably greater than 25 ° C, more preferably from about 28 ° C to about 40 ° C) glass transition temperature, wherein in a fully hydrated state of the ophthalmic device material having: a glass transition of less than 20 ° C (preferably less than 18 ° C, more preferably less than 15 ° C) transition temperature, at 589nm and at room temperature (23 ° C ± 3 ° C) measured is greater than 1.50 (preferably greater than 1.51, more preferably greater than 1.52) is off 率、在从16°C至45°C的温度下按重量计小于4.5% (优选从约1%至约4.2%，更优选从约1.5%至约3.9%)的平衡水含量、特征在于不具有明场微液泡和每个观察屏约10个或更少个微液泡的抗闪光性、从约I.OMPa至约60.OMPa (优选从约2. OMPa至约55. OMPa，更优选从约3. OMPa至50. OMPa)的杨氏模量、大于90% (优选至少约100%，更优选至少约110 %)的断裂伸长率、以及小于6. OMPa (优选约5.5MPa或更低，更优选约5. OMPa或更低）的25%割线模量。 Rate, the equilibrium water content at a temperature from 16 ° C to 45 ° C by weight less than 4.5% (preferably from about 1% to about 4.2%, more preferably from about 1.5% to about 3.9%), characterized in that no micro-bubble and having a bright-field observation of each panel of about 10 or fewer micro-bubble anti-glare properties, from about to about I.OMPa 60.OMPa (preferably from about 2. OMPa to about 55. OMPa, more preferably from 3. OMPa to about 50. OMPa) Young's modulus, greater than 90% (preferably at least about 100%, more preferably at least about 110%) of the elongation at break, and is less than 6. OMPa (or more preferably from about 5.5MPa lower, more preferably about 5. OMPa or less) 25% secant modulus. 加热至35°C时保持基本上透明或透明（S卩， 其中T23和T35分别是该材料在23 ， °〇和35°(^下的介于400nm至700nm之间的平均透光率）。 Holding heated to 35 ° C is substantially transparent or clear (S Jie, T23 and T35, respectively, wherein the material is at 23, ° and 35 ° between square (^ at 400nm to average light transmittance between 700nm). 3. 如权利要求1或2所述的眼科装置材料，其中处于完全水合状态的该装置材料在10年加速老化(在平衡盐溶液中90°C，81天)之后具有约30CCT或更低的表面光散射。 3. After the ophthalmic device material of claim 1 or claim 2, wherein the apparatus is fully hydrated material 10 in a state of accelerated aging (balanced salt solution at 90 ° C, 81 days) of about or less 30CCT light scattering surface. 4. 如权利要求1至3中任一项所述的眼科装置材料，其中在化学式⑴中，8:是(CH2)ml,ml 是2-5，Υι不存在或是0，wl是0或1，并且Di是Η。 4. 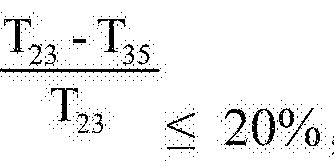 The ophthalmic device material according to any one of claims 1 to 3, wherein in the formula ⑴ in 8: is (CH2) ml, ml is 2-5, Υι is absent or 0, WL is 0 or 1, and Di is Η. 5. 如权利要求1至4中任一项所述的眼科装置材料，其中所述一种或多种芳基丙烯酸单体是:丙烯酸2-乙基苯氧基酯；甲基丙烯酸2-乙基苯氧基酯;丙烯酸苯酯；甲基丙烯酸苯酯； 丙烯酸苄酯；甲基丙烯酸苄酯;丙烯酸2-苯基乙酯；甲基丙烯酸2-苯基乙酯；丙烯酸3-苯基丙酯；甲基丙烯酸3-苯基丙酯；丙烯酸4-苯基丁酯；甲基丙烯酸4-苯基丁酯；丙烯酸4-甲基苯酯；甲基丙烯酸4-甲基苯酯；丙烯酸4-甲基苄酯；甲基丙烯酸4-甲基苄酯；丙烯酸2-2-甲基苯乙酯；甲基丙烯酸2,2_甲基苯乙酯;丙烯酸2,3_甲基苯乙酯；甲基丙烯酸2,3_甲基苯乙酯；丙烯酸2,4_甲基苯乙酯；甲基丙烯酸2,4_甲基苯乙酯；丙烯酸2-(4-丙基苯基）乙酯；甲基丙烯酸2- (4-丙基苯基）乙酯；丙烯酸2- (4- (1-甲基乙基）苯基）乙酯；甲基丙烯酸2- (4-(1-甲基乙基)苯基）乙酯;丙烯酸2-(4-甲氧基苯基）乙酯；甲基丙 5. The ophthalmic device material according to any one of claims 1 to 4, wherein the one or more aryl acrylic monomers are: ethyl acrylate, 2-phenoxyethyl acrylate; ethyl methacrylate, 2 phenoxy acrylate; phenyl acrylate; phenyl methacrylate; benzyl acrylate; benzyl methacrylate; 2-phenylethyl acrylate; methacrylate, 2-phenylethyl methacrylate; acrylate, 3-phenylpropionate acrylate; 3-phenyl-propyl methacrylate; 4-phenyl-butyl acrylate; 4-phenyl-butyl methacrylate; acrylate, 4-methylphenyl acrylate; methyl methacrylate, phenyl methacrylate; 4 - methylbenzyl acrylate; methacrylic acid 4-methylbenzyl methacrylate; 2-2- methyl benzyl methacrylate; methyl methacrylate, phenyl methacrylate 2,2_; phenyl acrylate, methyl methacrylate 2,3_ ; methyl methacrylate, phenyl methacrylate 2,3_; benzyl acrylate, methyl methacrylate 2,4_; methyl methacrylate, phenyl methacrylate 2,4_; acrylate, 2- (4-propylphenyl) ethyl esters; methacrylate, 2- (4-propylphenyl) ethyl methacrylate; acrylate, 2- (4- (1-methylethyl) phenyl) ethyl; methacrylate, 2- (4- (1- ethyl) phenyl) ethyl; 2- (4-methoxyphenyl) ethyl; methylpropan 酸2-(4-甲氧基苯基）乙酯；丙烯酸2- (4-环己基苯基）乙酯；甲基丙烯酸2- (4-环己基苯基）乙酯；丙烯酸2- (2-氯苯基）乙酯；甲基丙烯酸2-(2-氯苯基）乙酯;丙烯酸2-(3-氯苯基）乙酯；甲基丙烯酸2-(3-氯苯基）乙酯；丙烯酸2-(4-氯苯基）乙酯；甲基丙烯酸2-(4-氯苯基）乙酯；丙烯酸2-(4-溴苯基） 乙酯；甲基丙烯酸2- (4-溴苯基）乙酯；丙烯酸2- (3-苯基苯基）乙酯；甲基丙烯酸2- (3-苯基苯基）乙酯;丙烯酸2-(4-苯基苯基）乙酯；甲基丙烯酸2-(4-苯基苯基）乙酯;丙烯酸2-(4-苄基苯基）乙酯；甲基丙烯酸2-(4-苄基苯基）乙酯;丙烯酸2-(苯硫基）乙酯；甲基丙烯酸2-(苯硫基）乙酯；丙烯酸2-苄氧基乙酯；丙烯酸3-苄氧基丙酯；甲基丙烯酸2-苄氧基乙酯；甲基丙烯酸3-苄氧基丙酯；丙烯酸2-[2-(节氧基）乙氧基]乙酯；甲基丙烯酸2-[2-(节氧基）乙氧基]乙酯;或其组合。 Acid 2- (4-methoxyphenyl) ethyl methacrylate; acrylate, 2- (4-phenyl-cyclohexyl) ethyl; methacrylate, 2- (4-cyclohexylphenyl) ethyl methacrylate; acrylate, 2- (2 - chlorophenyl) ethyl; methacrylate, 2- (2-chlorophenyl) ethyl methacrylate; acrylate, 2- (3-chlorophenyl) ethyl; methacrylate, 2- (3-chlorophenyl) ethyl ; 2- (4-chlorophenyl) ethyl; methacrylate, 2- (4-chlorophenyl) ethyl; 2- (4-bromophenyl) ethyl; methacrylate, 2- (4- bromophenyl) ethyl; acrylate, 2- (3-phenylphenyl) ethyl acrylate; methacrylate, 2- (3-phenylphenyl) ethyl methacrylate; acrylate, 2- (4-phenylphenyl) ethyl ; methacrylate, 2- (4-phenylphenyl) ethyl methacrylate; acrylate, 2- (4-benzyl-phenyl) ethyl; methacrylate, 2- (4-benzyl-phenyl) ethyl methacrylate; acrylate, 2- (phenylthio) ethyl; methacrylate, 2- (phenylthio) ethyl; 2-benzyloxy-ethyl acrylate; 3-benzyloxy-propyl acrylate; 2-benzyloxy-ethyl methacrylate; 3-benzyloxy-propyl methacrylate; 2- [2- (section) ethoxy] ethyl; methacrylate, 2- [2- (section) ethoxy] ethyl ester; or a combination thereof. 6. 如权利要求1至5中任一项所述的眼科装置材料，其中所述一种或多种芳基丙烯酸单体是:丙烯酸2-苯基乙酯;丙烯酸3-苯基丙酯;丙烯酸4-苯基丁酯;丙烯酸5-苯基戊酯;丙烯酸2-苄氧基乙酯;丙烯酸3-苄氧基丙酯;丙烯酸2- [2-(苄氧基）乙氧基]乙酯;或其组合。 6. The ophthalmic device material according to 5 claim, wherein the one or more aryl acrylic monomers are: 2-phenylethyl acrylate; 3-phenyl-propyl acrylate; 4-phenyl-butyl acrylate; 5-phenyl-pentyl acrylate, methacrylate; 2-benzyloxy-ethyl; 3-benzyloxy-propyl methacrylate; 2- [2- (benzyloxy) ethoxy] ethyl esters; or combinations thereof. 7. 如权利要求1至6中任一项所述的眼科装置材料，其中该可聚合组合物包含按重量计从约54%至约75% (更优选从约60%至约70%)的所述一种或多种具有化学式⑴的芳基丙烯酸单体。 7. The ophthalmic device material according to any one of claim 6, wherein the polymerizable composition comprises by weight from about 54% to about 75% (more preferably from about 60% to about 70%) of the one or more formula ⑴ aryl acrylic monomers. 8. 如权利要求1至7中任一项所述的眼科装置材料，其中该可聚合组合物包含按重量计从约20%至约30% (更优选从约22.5%至约27.5%)的N，N二甲基丙烯酰胺。 8. The ophthalmic device material according to claim 7, wherein the polymerizable composition comprises by weight from about 20% to about 30% (more preferably from about 22.5% to about 27.5%) of N, N-dimethylacrylamide. 9. 如权利要求1至8中任一项所述的眼科装置材料，其中组分(a)和组分(b)的量的总和是按重量计至少约85% (更优选按重量计至少约90%)。 9. The ophthalmic device material according to any of claims 1 to 8, wherein the sum of components (a) and the amount of component (b) is by weight of at least about 85% (by weight, more preferably at least about 90%). 10. 如权利要求1至9中任一项所述的眼科装置材料，其中该可聚合组合物包含按重量计从约1.0 %至约6.0 %，优选按重量计从约1.5 %至约5.0 %，更优选按重量计从约2.0 %至约4.0 %的该可聚合交联剂。 10. The ophthalmic device material according to claim 9, wherein the polymerizable composition comprises by weight from about 1.0% to about 6.0%, by weight, preferably from about 1.5% to about 5.0% , by weight, more preferably from about 2.0% to about 4.0% of the polymerizable cross-linking agent. 11. 如权利要求10所述的眼科装置材料，其中该可聚合交联剂选自由以下各项组成的组：乙二醇二甲基丙烯酸酯；二乙二醇二甲基丙烯酸酯;三乙二醇二甲基丙烯酸酯；四乙二醇二甲基丙烯酸酯；甲基丙烯酸烯丙酯；1，3_丙二醇二甲基丙烯酸酯;2,3_丙二醇二甲基丙烯酸酯；1，6_己二醇二甲基丙烯酸酯；1，4_丁二醇二甲基丙烯酸酯；乙二醇二丙烯酸酯；二乙二醇二丙烯酸酯；三乙二醇二丙烯酸酯；四乙二醇二丙烯酸酯；丙烯酸烯丙酯；1，3_丙二醇二丙烯酸酯；2，3-丙二醇二丙烯酸酯；1，6-己二醇二丙烯酸酯；1，4-丁二醇二丙烯酸酯； N，N' -六亚甲基双丙烯酰胺;N，N' -六亚甲基双甲基丙烯酰胺;N，N' -二羟基亚乙基双丙烯酰胺;N，N' -二羟基亚乙基双甲基丙烯酰胺;N，N' -亚甲基双丙烯酰胺;N，N' -亚甲基双甲基丙烯酰胺;CH2 = C (CH3) C (=0) O- (CH2CH2O) PC (=0) C (CH3) = CH2 11. The ophthalmic device material of the group according to claim 10, wherein the polymerizable crosslinking agent is selected from the group consisting of: ethylene glycol dimethacrylate; diethylene glycol dimethacrylate; triacetate hexanediol dimethacrylate; tetraethylene glycol dimethacrylate; allyl methacrylate; 1,3_ glycol dimethacrylate; 2,3_ glycol dimethacrylate; 1,6 _ hexanediol dimethacrylate; 1,4_ butanediol dimethacrylate; ethylene glycol diacrylate; diethylene glycol diacrylate; diacrylate triethylene glycol; tetraethylene glycol diacrylate; allyl methacrylate; 1,3_ glycol diacrylate; 2,3-propylene glycol diacrylate; 1,6-hexanediol diacrylate; 1,4-butanediol diacrylate; N , N '- hexamethylene bis acrylamide; N, N' - hexamethylene bis methacrylamide; N, N '- dihydroxy ethylene bis acrylamide; N, N' - ethylene-dihydroxy bis methacrylamide; N, N '- methylene bis acrylamide; N, N' - methylene bis methacrylamide; CH2 = C (CH3) C (= 0) O- (CH2CH2O) PC (= 0) C (CH3) = CH2 其中p = 1-50; CH2 = CHC (=0) 0- (CH2CH2O) pC (=0) CH=CH2，其中p = 1 -50; CH2 = C (CH3) C (=0) 0 (CH2) t〇-C (=0) C (CH3)= CH2，其中t = 3-20; CH2 = CHC (=0) 0 (CH2) t〇-C (=0) CH=CH2，其中t = 3-20，以及其组合(优选选自由以下各项组成的组：1，6_己二醇二丙烯酸酯、1，4_丁二醇二丙烯酸酯、N，N'_六亚甲基双丙烯酰胺、以及其组合）。 Wherein p = 1-50; CH2 = CHC (= 0) 0- (CH2CH2O) pC (= 0) CH = CH2, wherein p = 1 -50; CH2 = C (CH3) C (= 0) 0 (CH2) t〇-C (= 0) C (CH3) = CH2, where t = 3-20; CH2 = CHC (= 0) 0 (CH2) t〇-C (= 0) CH = CH2, where t = 3- group 20, and combinations thereof (preferably selected from the group consisting of: hexanediol diacrylate 1,6_, 1,4_-butanediol diacrylate, N, N'_ hexamethylene bisacrylamide , and combinations thereof). 其中：A2是H或CH3; Q2和Q2'彼此独立地是直接键、0、ΝΗ、或C (=0) NHCH2CH2O5X2和X2'彼此独立地是直接键、0、NH、0C (=0) ΝΗ、或NHC (=0) NH (优选地是直接键或0) ;R2和R2'彼此独立地是直接键或(CH2)p(优选地是直接键）；p=l-3;G2是HX1-C4烷基、（CH2) m2NH2、（CH2) m2C02H、 或R2 ' -X2 ' -Q2 ' -C (=0) CA2 - CH2 (优选地是&amp;-〇4烷基或R2 ' -X2 ' -Q2 ' -C (= 0) CA2 - CH2) ; m2 = 2-6;并且当G = H、C1-C4烷基、（CH2) m2NH2、或（CH2) m2⑶2H时，n2 = 45-225;否贝丨J，n2 = 51 -225 (优选当G2 = C1-C4烷基时n2 = 45-180,否则n2 = 51-225);和(iii) 其组合。 Wherein: A2 is H or CH3; Q2 and Q2 'are independently a direct bond, 0, ΝΗ, or C (= 0) NHCH2CH2O5X2 and X2' are independently a direct bond, 0, NH, 0C (= 0) ΝΗ , or NHC (= 0) NH (preferably a direct bond or 0); R2 and R2 'are each independently a direct bond or (CH2) p (preferably a direct bond); p = l-3; G2 is HX1 -C4 alkyl, (CH2) m2NH2, (CH2) m2C02H, or R2 '-X2' -Q2 '-C (= 0) CA2 - CH2 (preferably & amp; -〇4 alkyl, or R2' -X2 ' -Q2 '-C (= 0) CA2 - CH2); m2 = 2-6; and when G = H, C1-C4 alkyl, (CH2) m2NH2, or (CH2) m2⑶2H, n2 = 45-225; No shell Shu J, n2 = 51 -225 (preferably when G2 = C1-C4 alkyl n2 = 45-180, or n2 = 51-225); and (iii) combinations thereof. 13. 如权利要求9所述的眼科装置材料，其中该具有化学式（II)的含PEG的可聚合组分具有2，000-10，000道尔顿、优选2，000-8，000道尔顿、更优选2，000-6，000道尔顿、以及最优选2，500-6，000道尔顿的数均分子量。 13. The ophthalmic device material according to claim 9 Doyle preferably 2,000 to 8,000, wherein the PEG-containing polymerizable having the formula (II) having a partial 2,000-10,000 daltons, Dayton, more preferably 2,000 to 6,000 Daltons, and most preferably the number average molecular weight of 2,500-6,000 Daltons. 14. 如权利要求1至13中任一项所述的眼科装置材料，其中该可聚合组合物包含可聚合的UV吸收剂。 The ophthalmic device material of one of claims 1 to 13 as claimed in claim 14, wherein the polymerizable composition comprises a polymerizable UV absorber. 15. —种眼内透镜，包括如权利要求1至14中任一项所述的眼科装置材料。 15. - species intraocular lens, comprising the ophthalmic device material according to any of claims 1 to claim 14.